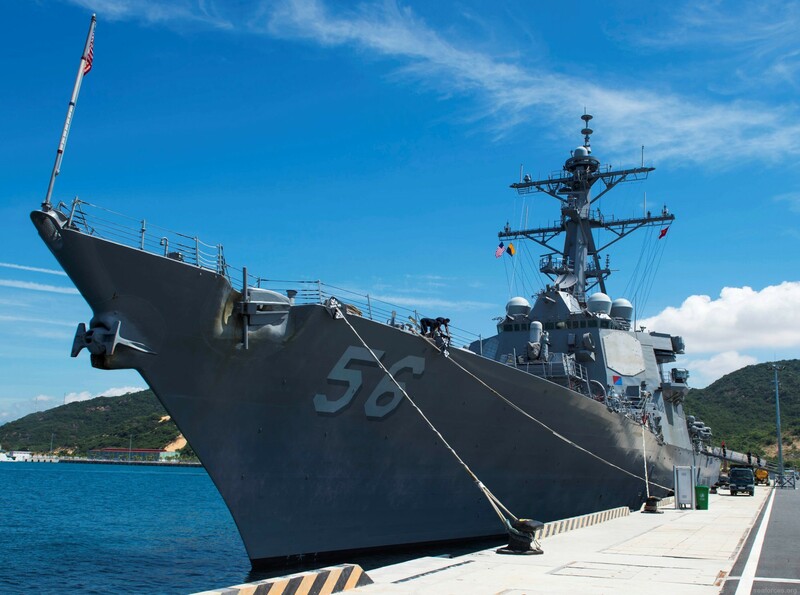 USS John S. McCain (DDG 56) departs Subic Bay, Philippines aboard heavy lift transport vessel MV Treasure. 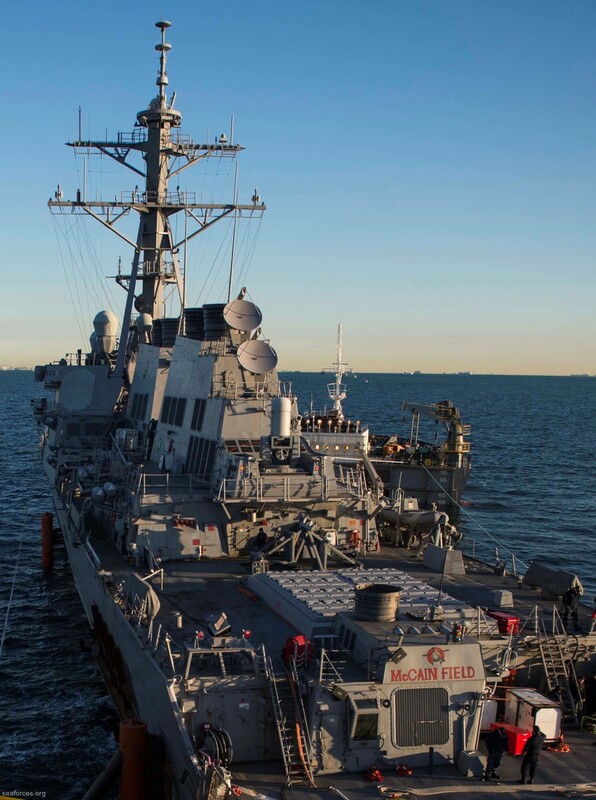 USS John S. McCain (DDG 56) makes preparations to load aboard the heavy lift transport M/V Treasure. 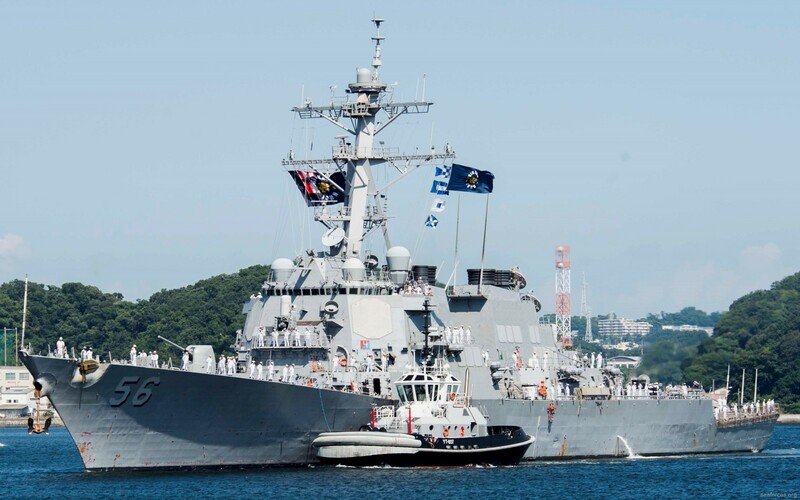 John S. McCain's keel was laid down on 3 September 1991, at the Bath Iron Works in Bath, Maine. 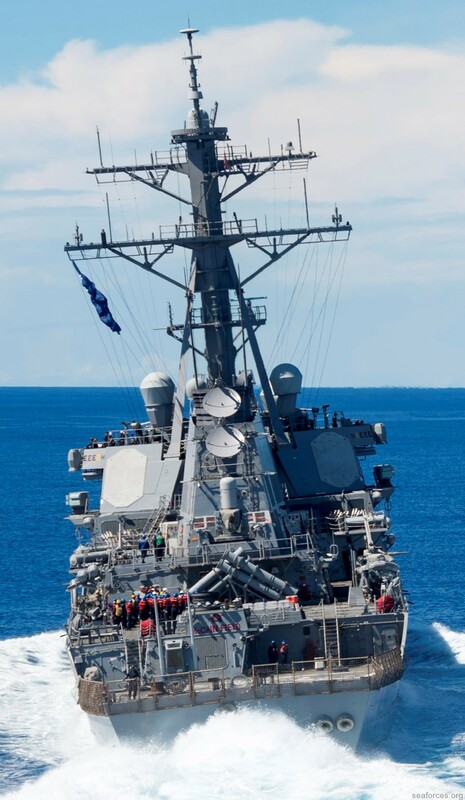 The ship was launched on 26 September 1992, sponsored by Cindy McCain, the wife of Senator John McCain. 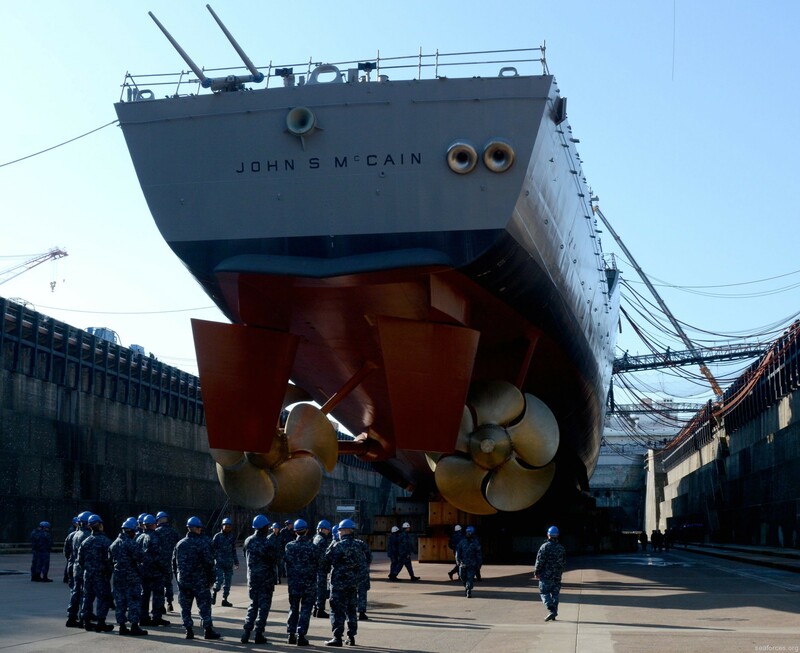 McCain was commissioned on 2 July 1994, at the Bath Iron Works. The former President of the United States, George H. W. Bush, was the ceremony's principal speaker. 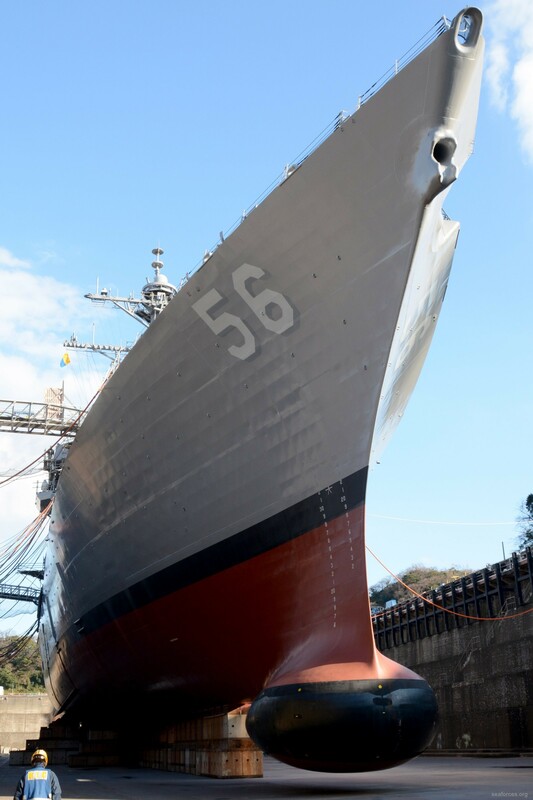 The ship was initially assigned a home port of Pearl Harbor, Hawaii and shifted to a forward-deploy port in Yokosuka, Japan in 1997. 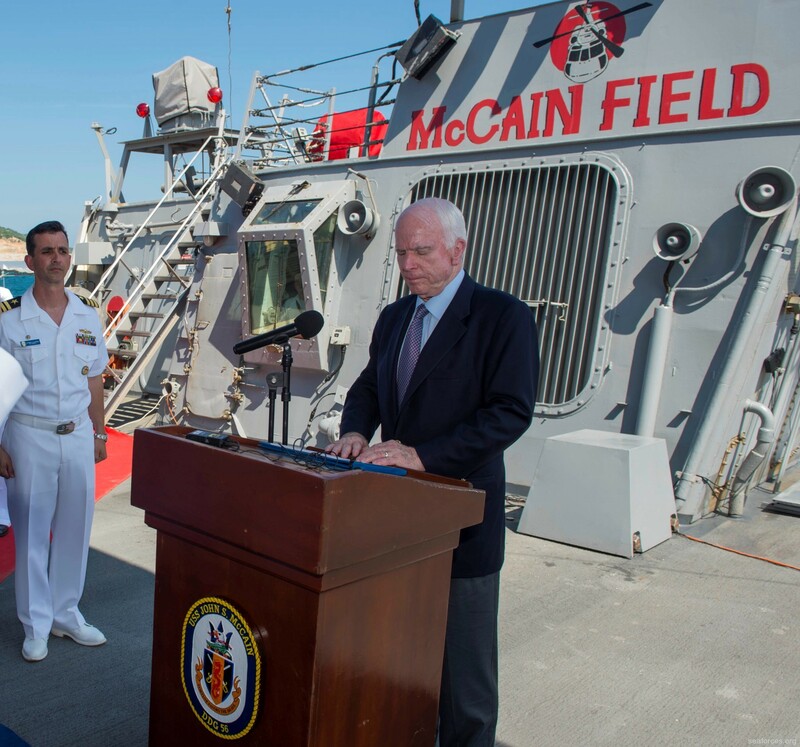 In January 2003, John S. McCain deployed to the Persian Gulf. 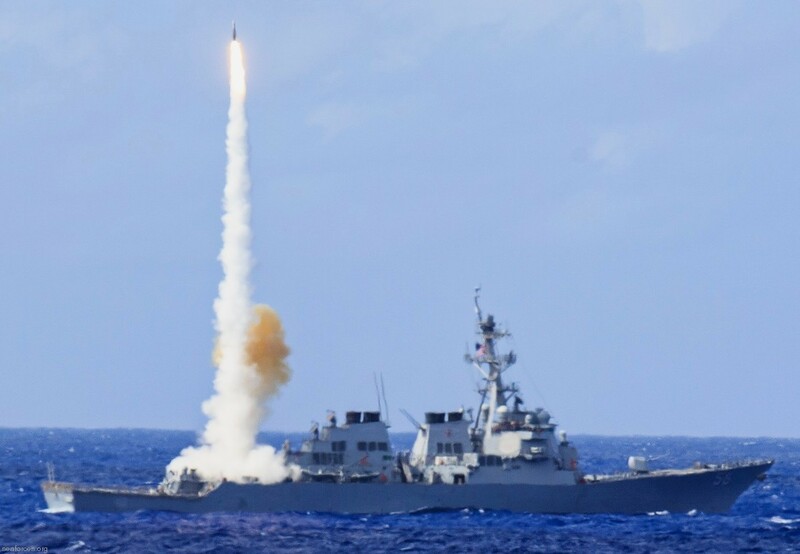 She launched 39 Tomahawk missiles in support of the invasion of Iraq and was awarded the Navy Unit Commendation for her service. 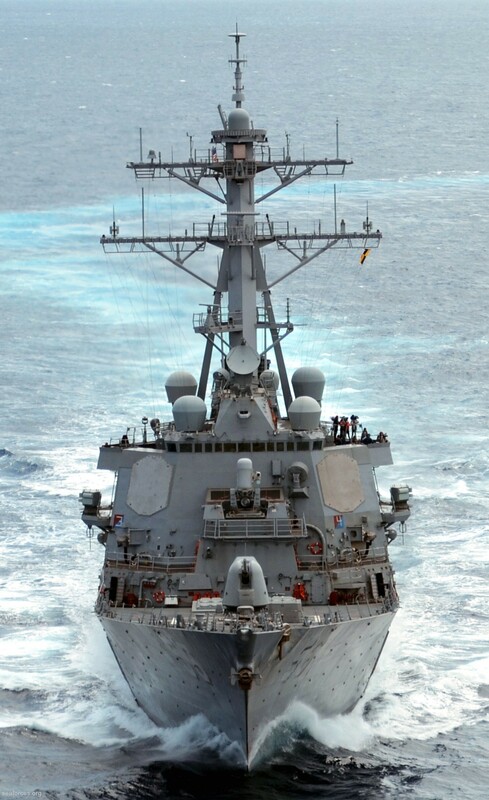 John S. McCain was awarded the Navy Battle E for DESRON 15 in 2003 and again in 2004. 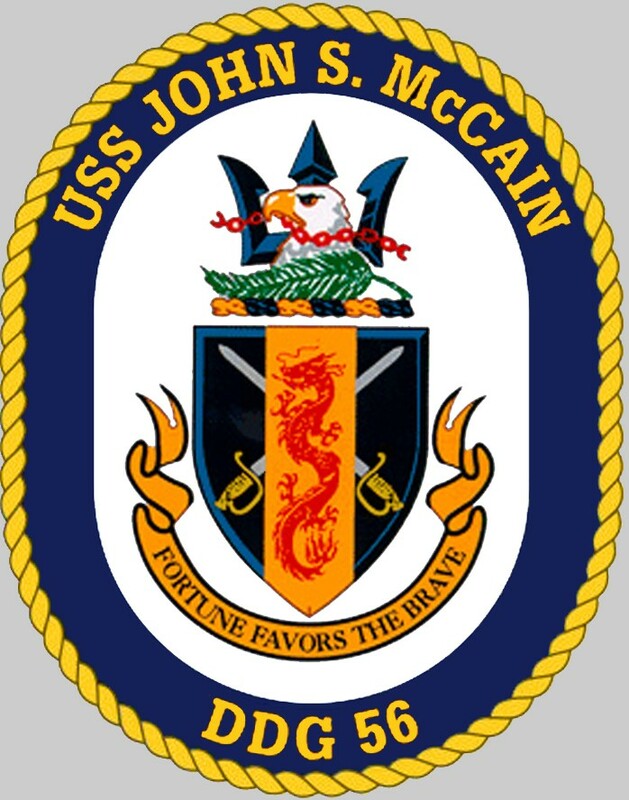 On 16 February 2007, John S. McCain was awarded the 2006 Battle "E" award. 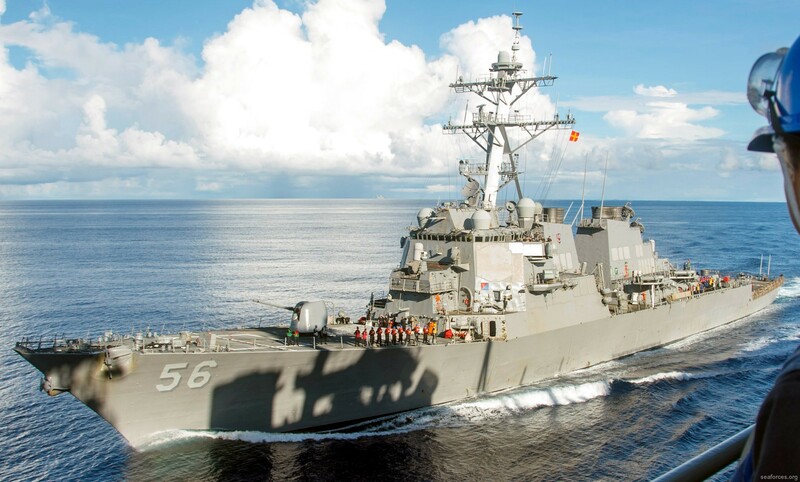 In June 2009, John S. McCain pursued the North Korean cargo ship Kang Nam 1 toward Burma in enforcement of the new United Nations resolution of an arms export embargo against North Korea. The vessel was suspected of carrying arms for the Burmese junta government. Kang Nam 1 returned to North Korea without delivering its cargo to Burma. 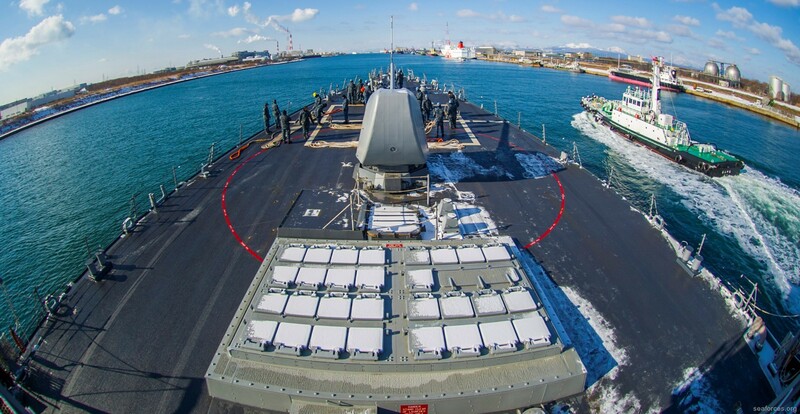 In March 2011, in company with the aircraft carrier Ronald Reagan, the ship was deployed off northeastern Honshu, Japan to assist with relief efforts after the 2011 Tohoku earthquake. During that time, the ship may have been exposed to leaking radiation from the Fukushima I nuclear accidents. 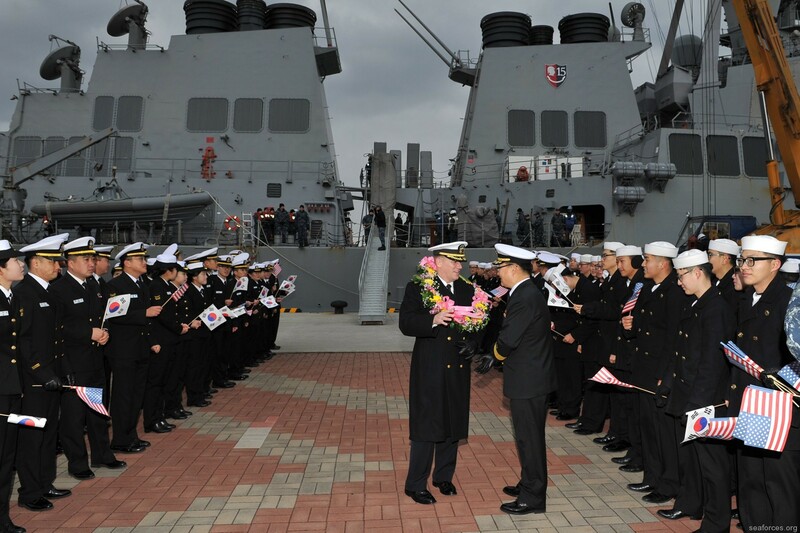 In April 2013, John S. McCain was sent to Korea during escalating tensions on the Korean peninsula. 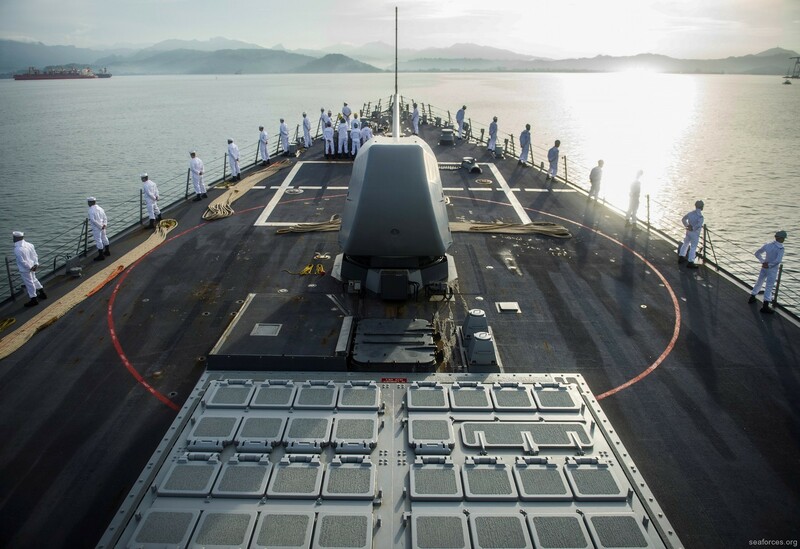 In June 2014 the destroyer was sent to Subic Bay to perform in CARAT (Cooperation Afloat Readiness and Training) exercises. 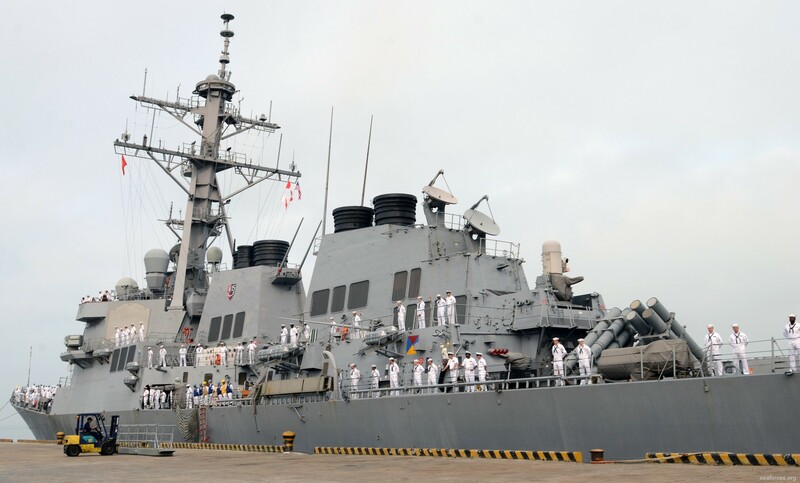 On 2 October 2016, USS John S. McCain and USS Frank Cable made the first port visit by US Navy ships to Cam Ranh Bay since end of the Vietnam War in 1975. 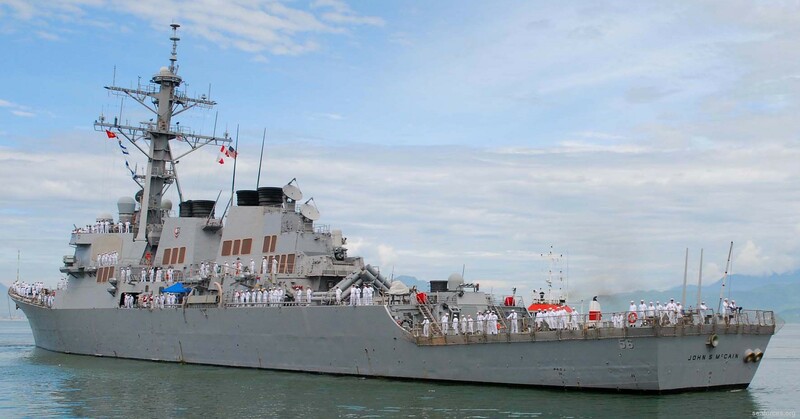 On 21 August 2017, the destroyer was involved in a collision with the Liberian-flagged Alnic MC off the coast of Malaysia east of the Strait of Malacca. 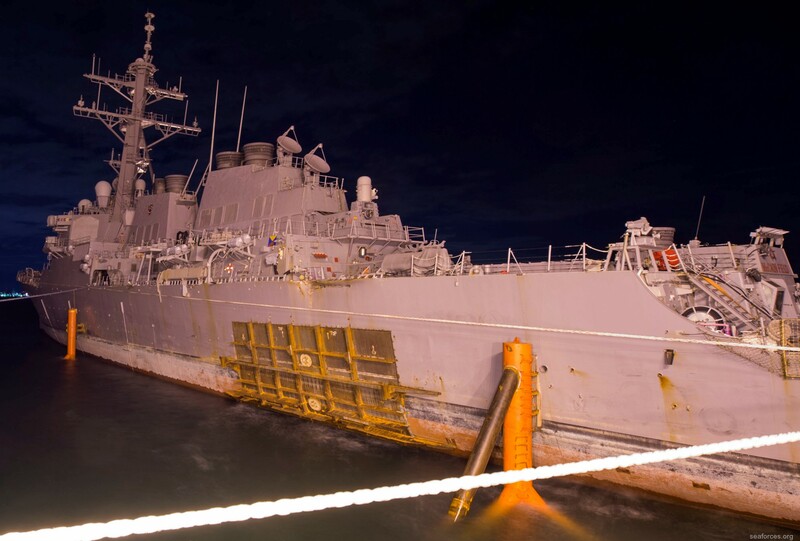 After the collision the ship, which sustained damage to her port side aft, was able to return to port under her own power. 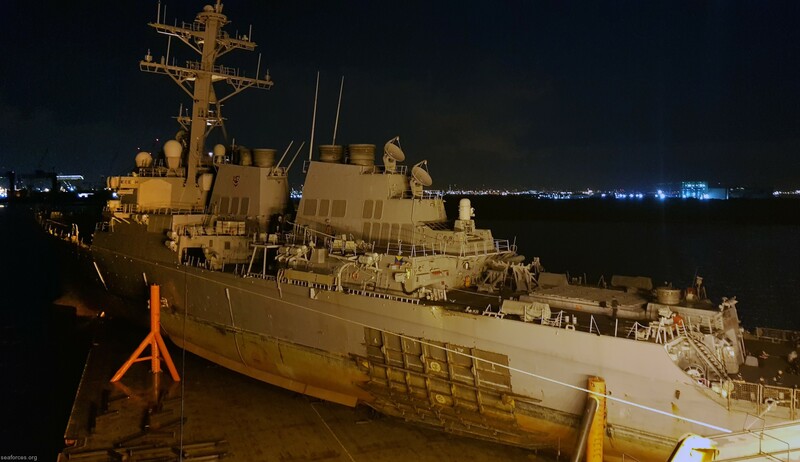 According to a United States Navy press release, the breach "resulted in flooding to nearby compartments, including crew berthing, machinery, and communications rooms." 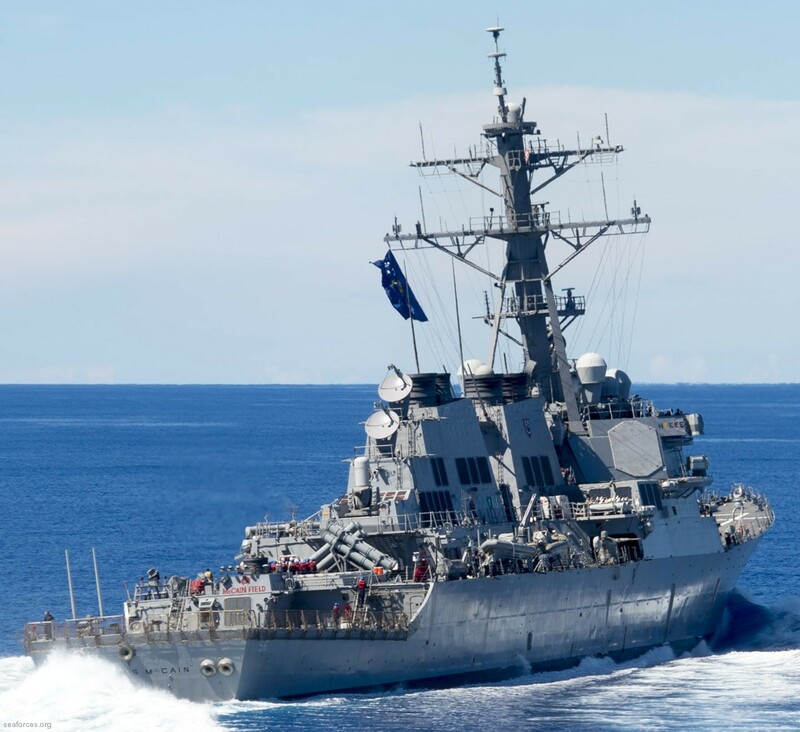 Initial casualty reports indicate ten sailors missing and five sailors injured. 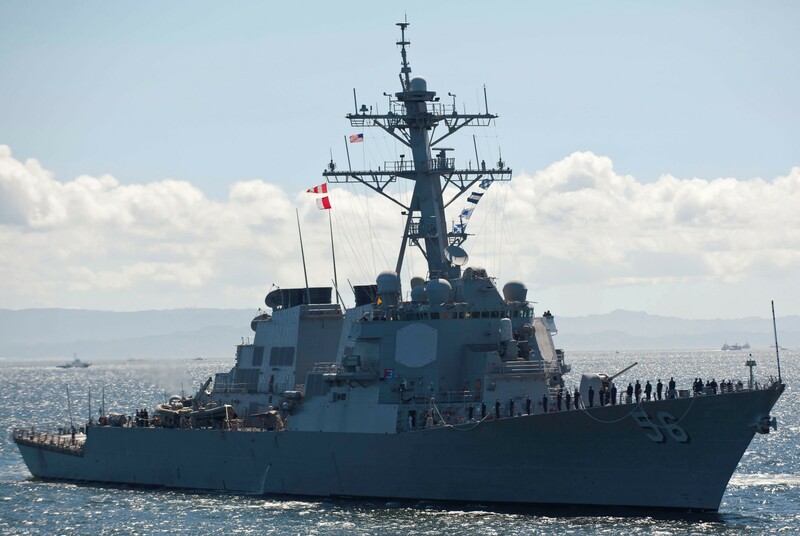 CHANGI NAVAL BASE, Republic Of Singapore (NNS) -- Adm. Scott Swift, commander, Pacific Fleet, said some of the 10 missing USS John S. McCain (DDG 56) Sailors were discovered Aug. 22, by divers performing recovery operations inside the guided-missile destroyer. 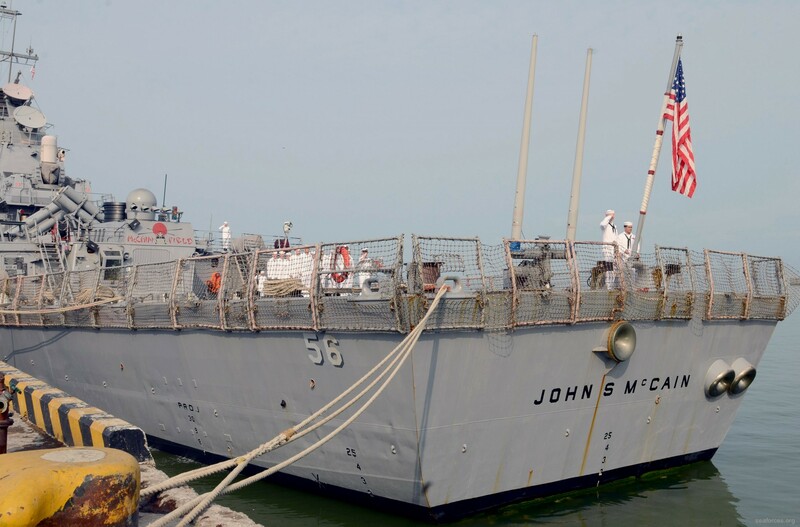 Swift also said the Royal Malaysian Navy has reported the discovery of potential remains of another missing McCain Sailor, located while the ship was providing search and rescue assistance east of the Straits of Malacca and Singapore. 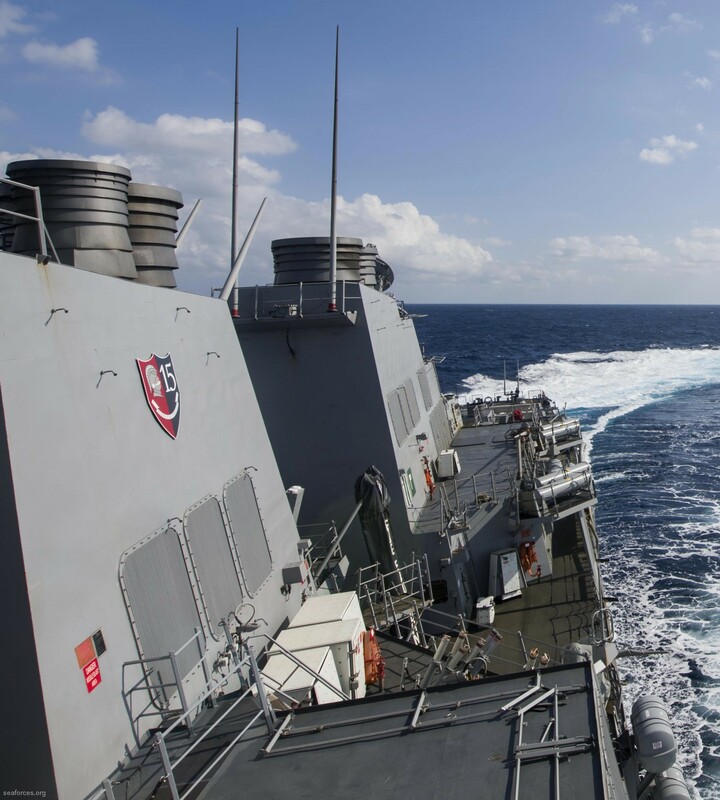 We are still searching for our missing Sailors. 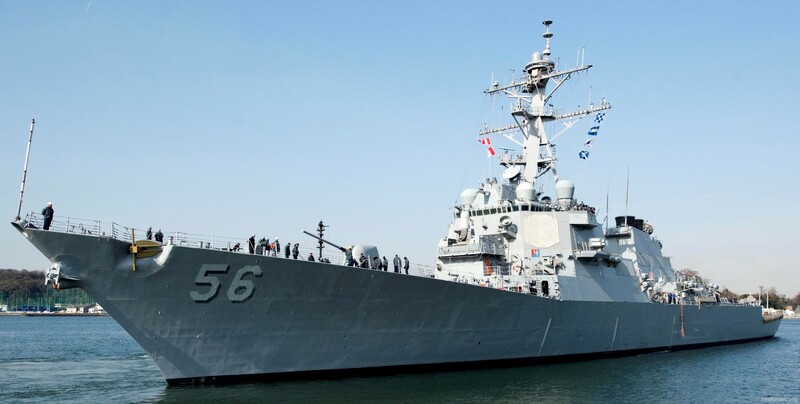 That remains our focus, said Swift to a group of international media during a press briefing at Changi Naval Base, Singapore, where McCain is currently moored. 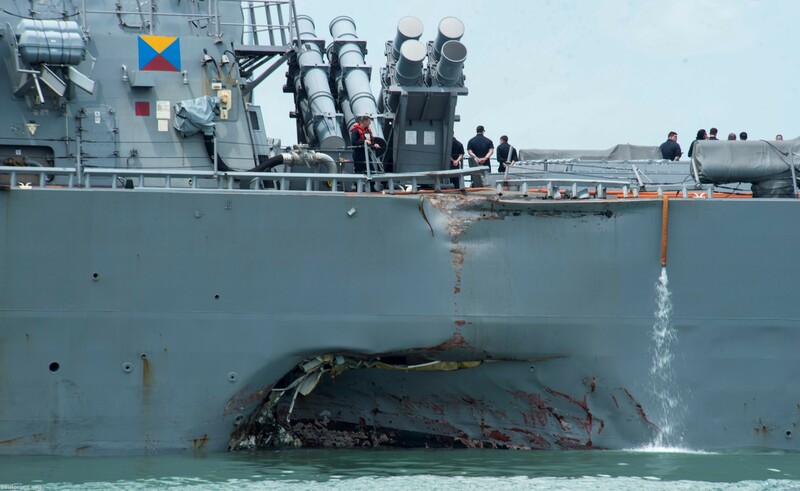 "Our thoughts and prayers continue to be with the families of those Sailors and the families of our Sailors who were injured," he said. 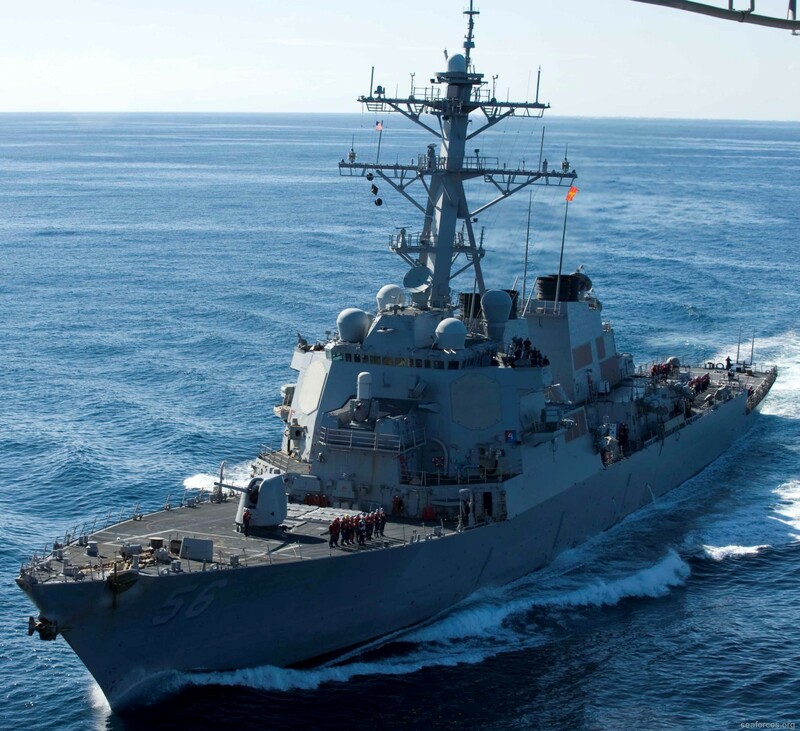 The search for the missing Sailors has been ongoing since early Aug. 21 following the collision of McCain and merchant vessel Alnic MC. 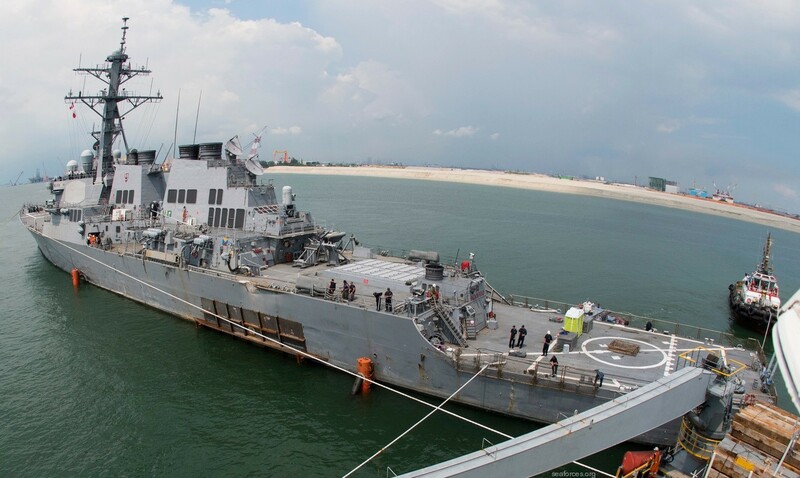 Royal Malaysian Navy coastal patrol craft Petir (12) and Pang Alang (39), Handalan-class missile boat KD Handalan and Lekiu-class frigate KD Lekiu (30) along with two Malaysian Maritime Enforcement Agency vessels assisted in Tuesday's search efforts. 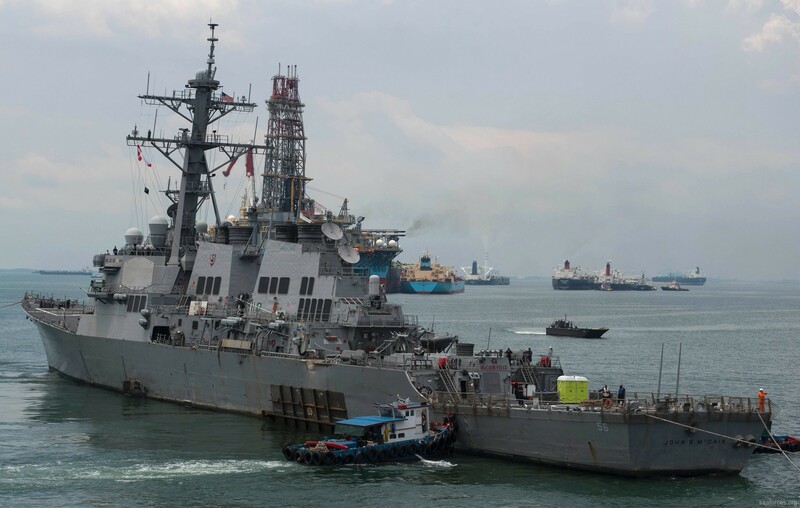 Republic of Singapore Navy Fearless-class patrol ships Noble Pearl (PCG 54) and Noble Knight (PCG 56) as well as Singaporean aircraft also aided in the day's search. 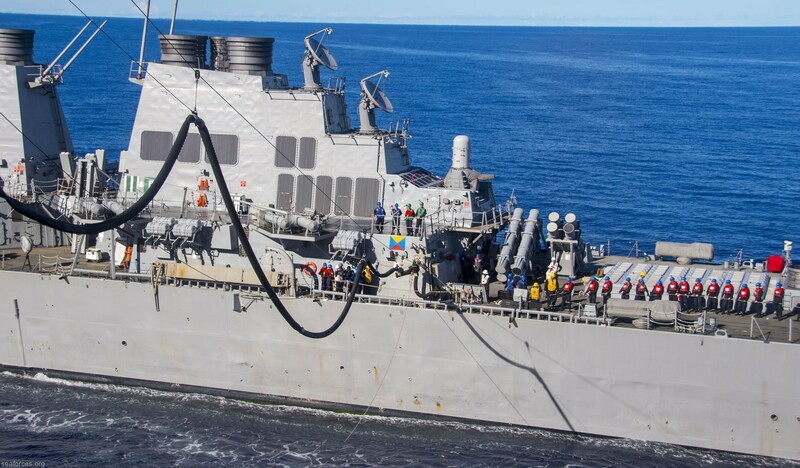 Those vessels were joined by aviation assets from USS America (LHA 6), which will continue combing the area east of the Straits of Malacca and Singapore in the vicinity of the collision. 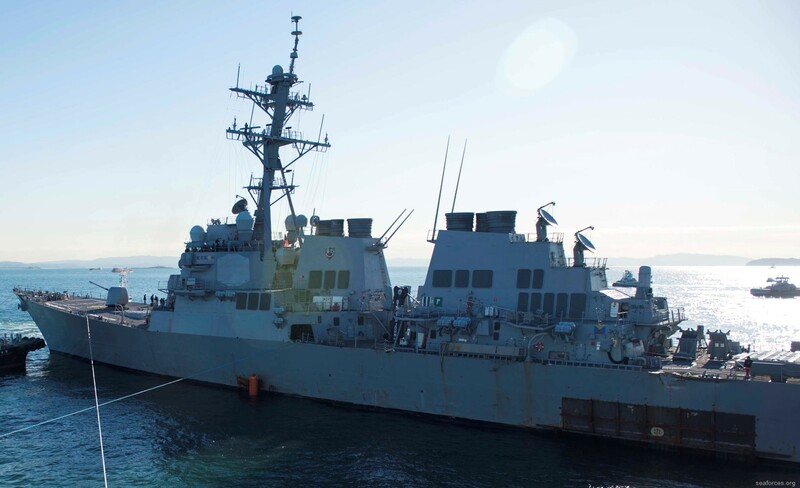 "While the search and rescue efforts continue, I sincerely thank our Singapore partners, our Malaysian partners and everyone who has responded with urgency, compassion and tireless commitment," Swift said. 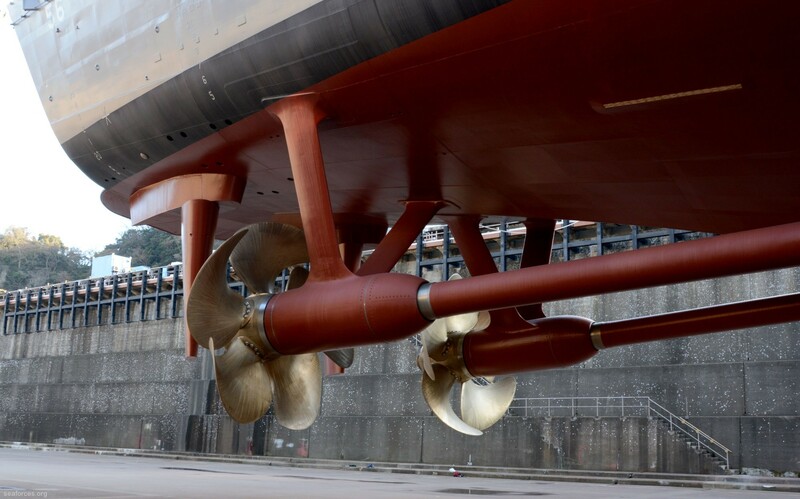 The ship was transiting to Singapore for a routine port visit when the collision occurred. 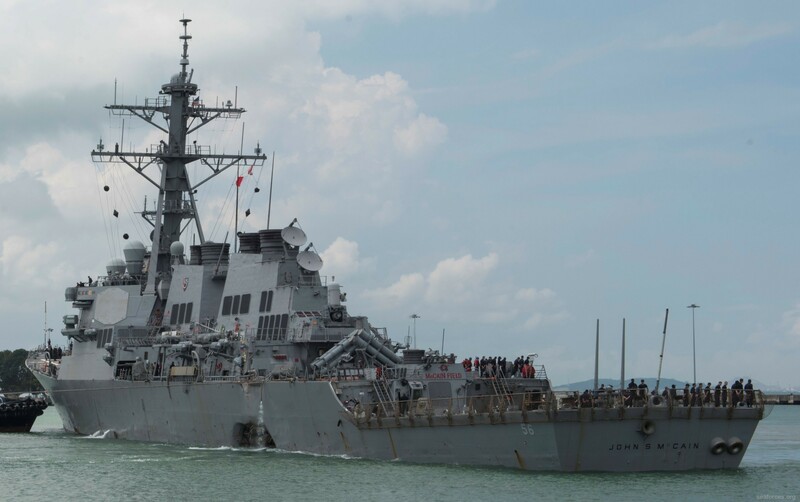 CHANGI NAVAL BASE, Republic Of Singapore (NNS) -- U.S. Navy and Marine Corps divers began searching for 10 Sailors from USS John S. McCain (DDG 56), missing since the guided-missile destroyer and merchant vessel Alnic MC collided early Aug. 21. 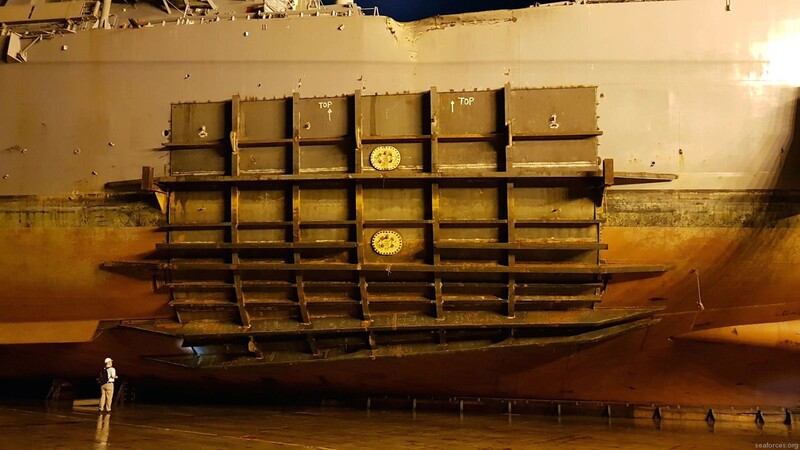 Equipped with surface supplied air rigs, divers will access sealed compartments located in damaged parts of the ship. 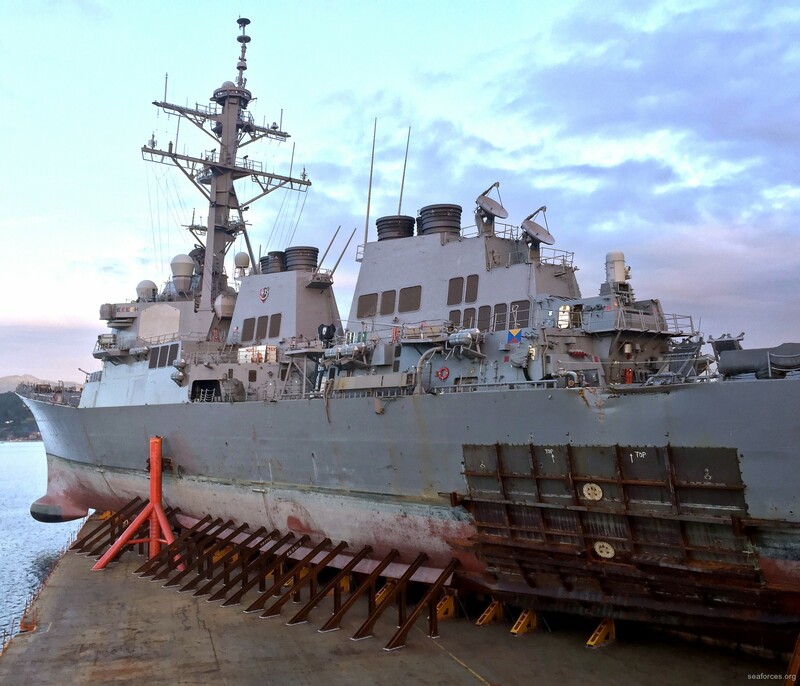 Additionally, they will conduct damage assessments of the hull and flooded areas. 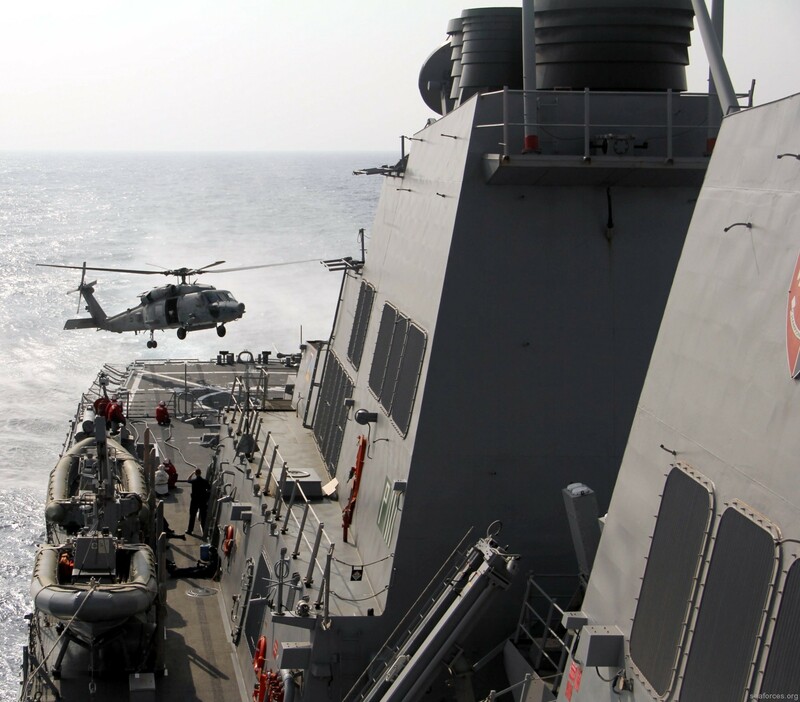 While diving proceeds, ships and aircraft from the Royal Malaysian Navy and Republic of Singapore Navy continue to provide search and rescue assistance along with two U.S. Navy MH-60 Seahawk helicopters from amphibious assault ship USS America (LHA 6). 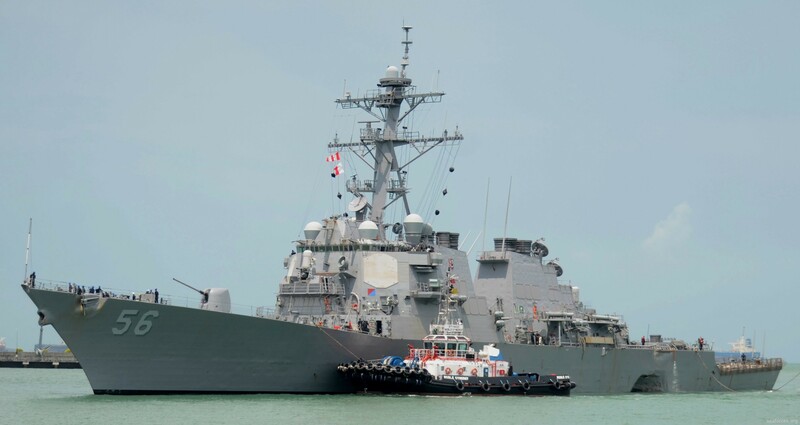 Those search efforts are focused on an area east of the Straits of Malacca and Singapore where the collision occurred as McCain was transiting to Singapore for a routine port visit. 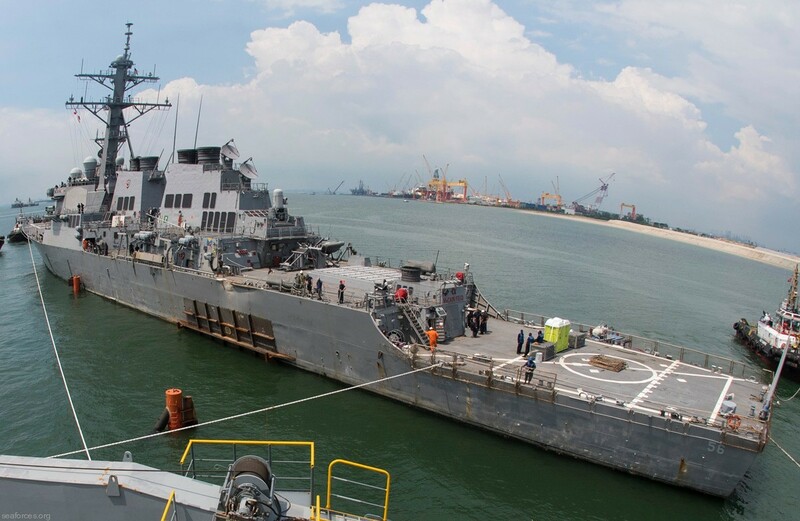 John S. McCain and America arrived at Changi Naval Base yesterday afternoon after shipboard damage control efforts by the crew had halted further McCain flooding. 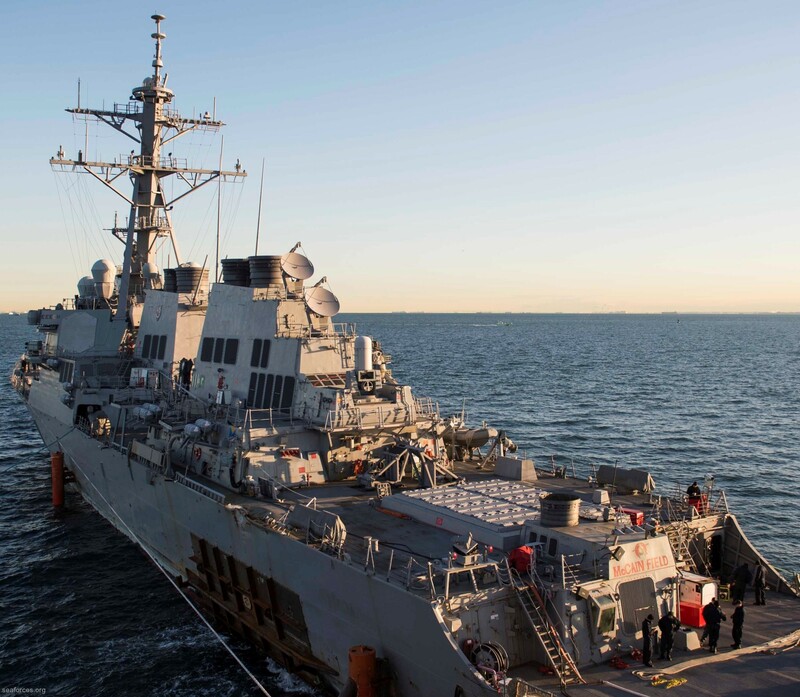 While both ships are in Singapore, America is providing meals, berthing and other support to McCain crew members and supporting damage control efforts on board which are focused on dewatering the ship and restoring auxiliary systems. Royal Malaysian Navy ship KD Handalan and two coastal patrol craft Petir (12) and Pang Alang (39) as well as two Malaysian Maritime Enforcement Agency vessels are assisting in the search, as are Republic of Singapore Navy Fearless-class patrol ships Noble Pearl (PCG 54) and Noble Knight (PCG 56). 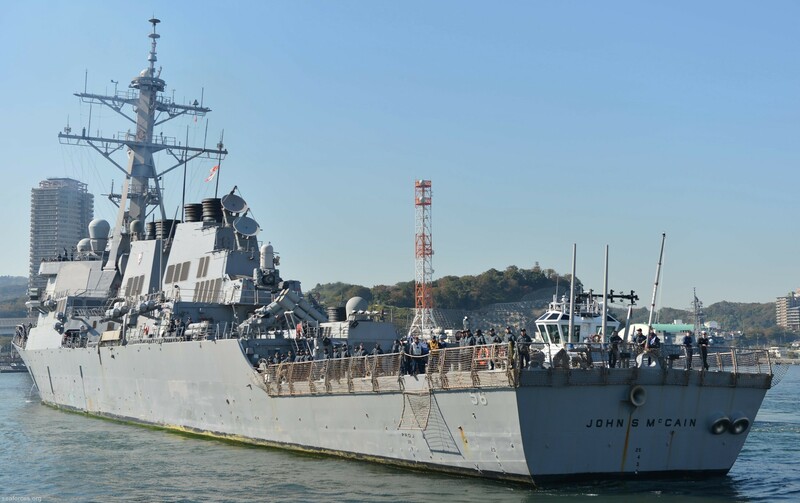 Several diving units are supporting search efforts, including Navy divers from Ship Repair Facility Yokosuka and Commander Logistics Group Western Pacific as well as Marine divers from 15th Marine Expeditionary Unit embarked on America. CHANGI NAVAL BASE, Republic of Singapore (NNS) -- Amphibious assault ship USS America (LHA 6) arrived Aug. 21 at Changi Naval Base and is moored across the pier from the guided-missile destroyer USS John S. McCain (DDG 56). 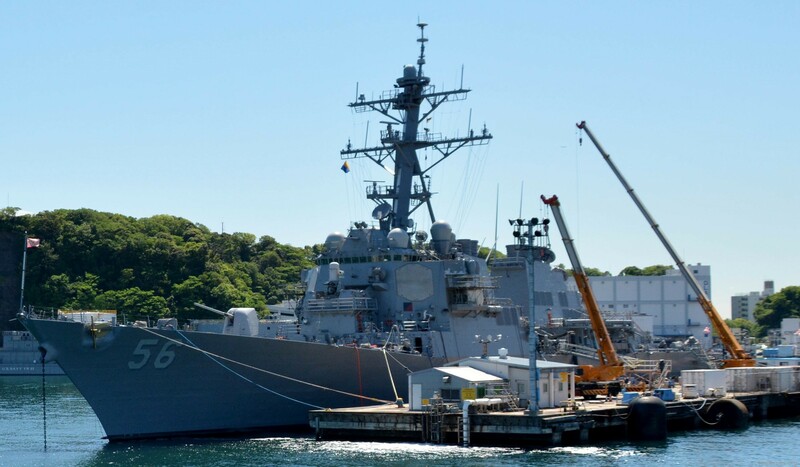 McCain was involved in a collision with the merchant vessel Alnic MC while underway east of the Straits of Malacca and Singapore early in the morning on Aug. 21 (as reported 6:24 a.m. Japan Standard Time) and arrived at Changi Naval Base in the afternoon. 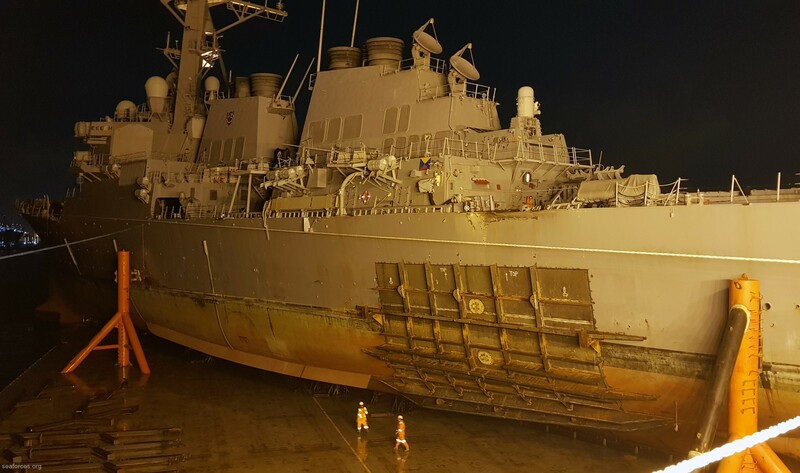 Significant damage to the hull resulted in flooding to nearby compartments, including crew berthing, machinery and communications rooms. Damage control efforts by the crew halted further flooding. 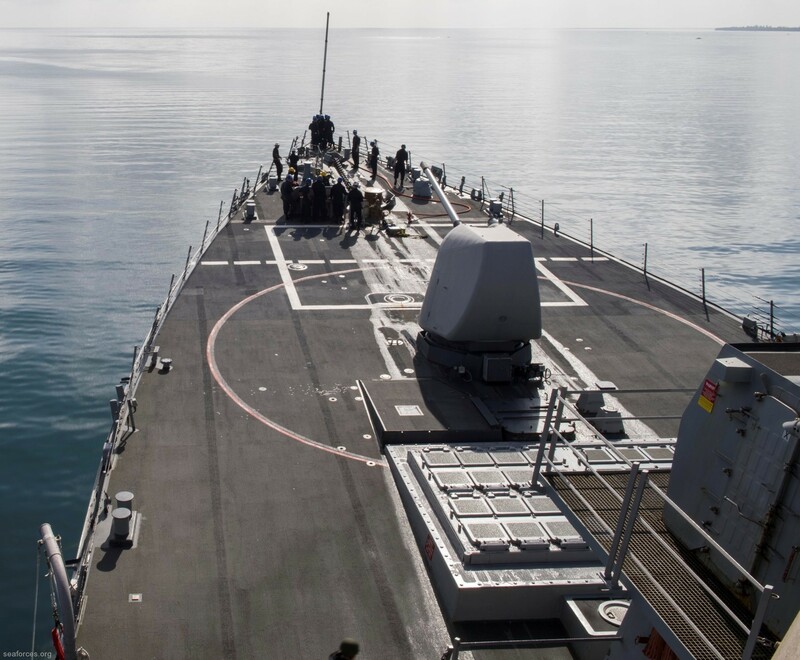 There are currently 10 Sailors missing and five injured. Four of the injured were medically evacuated by a Singapore Armed Forces Puma helicopter to a hospital in Singapore for non-life threatening injuries. 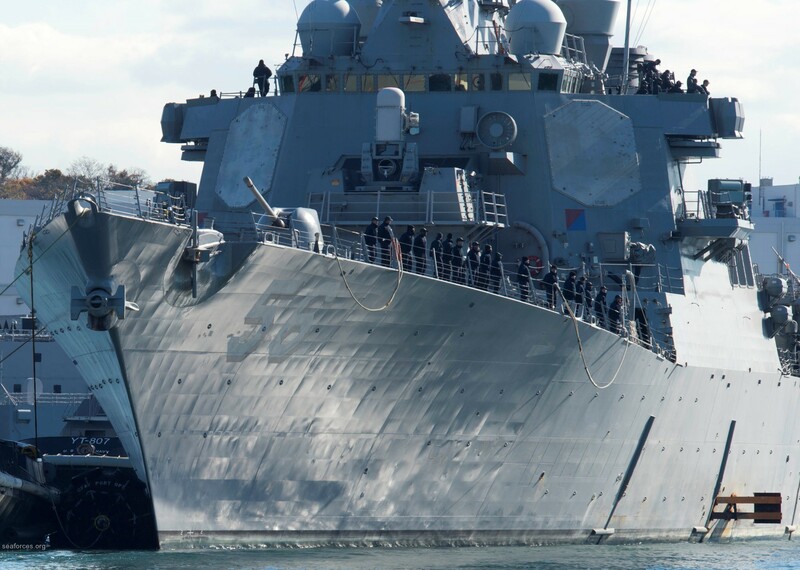 The fifth injured Sailor did not require further medical attention. 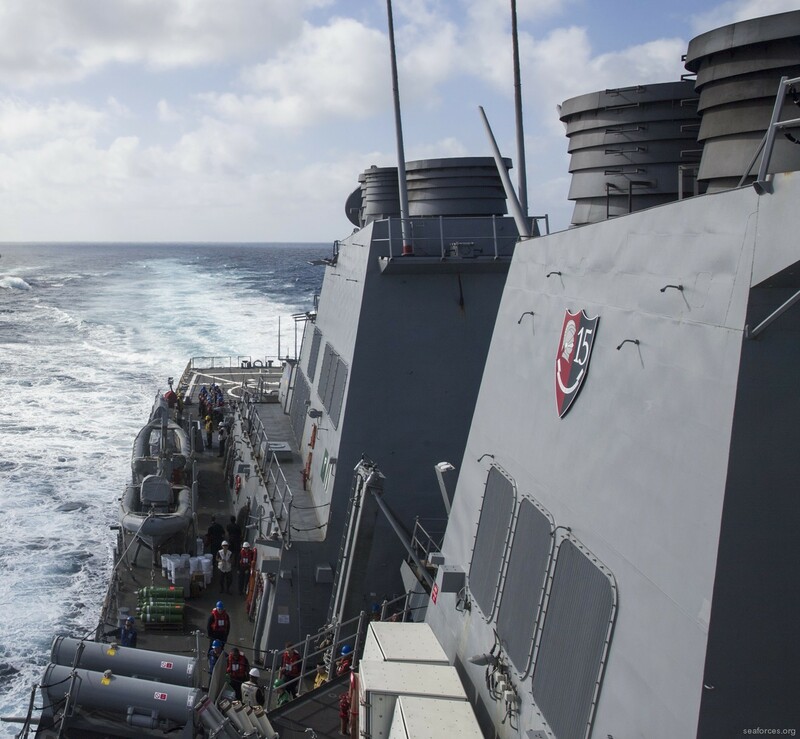 U.S. Navy MH-60S helicopters and MV-22 Ospreys from USS America are also supporting search efforts at sea. 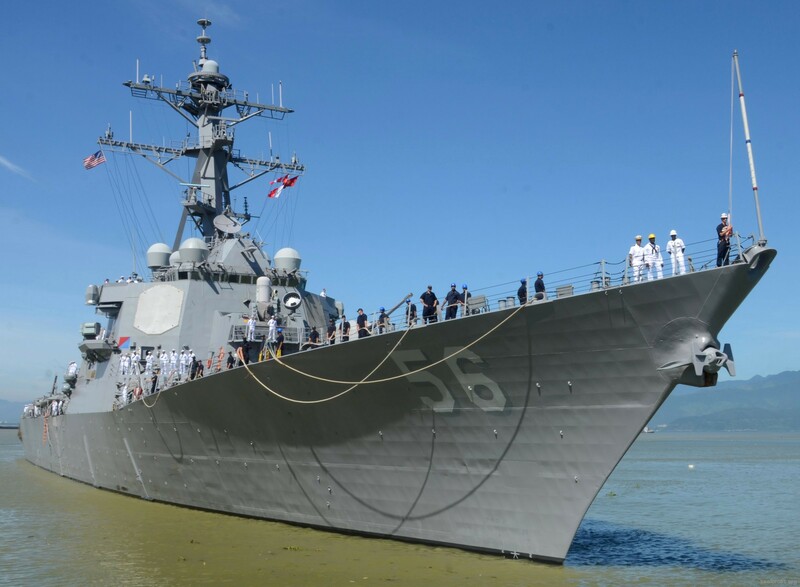 The guided-missile destroyer USS John S. McCain (DDG 56) has arrived at Changi Naval Base following a collision with the merchant vessel Alnic MC while underway east of the Straits of Malacca and Singapore on Aug. 21. 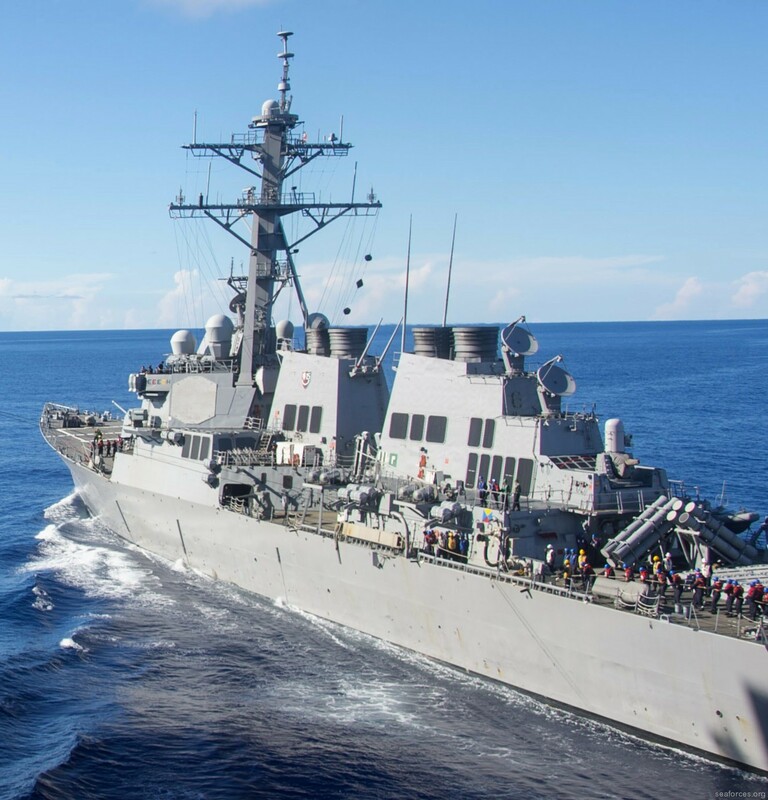 There are currently 10 Sailors missing and five injured. Search and rescue efforts are underway in coordination with local authorities. 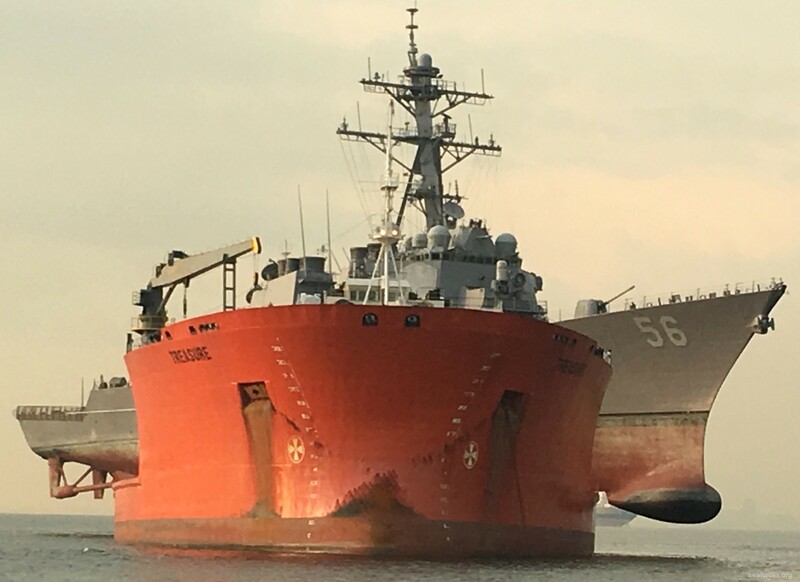 In addition to tug boats out of Singapore, Republic of Singapore Navy Fearless-class patrol ships RSS Gallant (97), RSS Resilience (82), RSN helicopters and Police Coast Guard vessel Basking Shark (55) are currently in the area to render assistance. 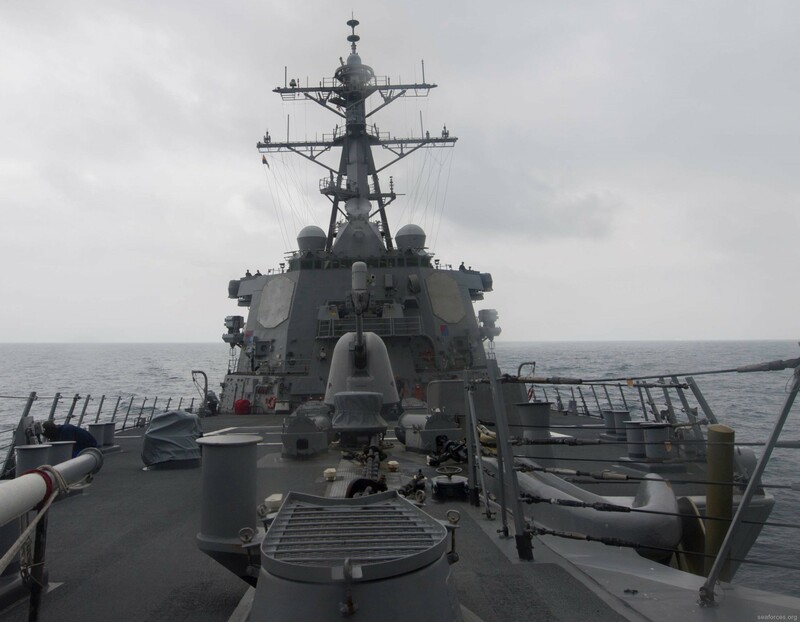 SOUTH CHINA SEA (NNS) -- The guided-missile destroyer USS John S. McCain (DDG 56) was involved in a collision with the merchant vessel Alnic MC while underway east of Singapore and the Strait of Malacca, Aug. 21. The two McCains - John Sidney, Sr., and John Sidney, Jr., served both in the clamor of battle and the long days of keeping the peace. They sacrificed just as the crews of this ship will sacrifice, in peace and war. For that is the lot, and the privilege of the sailor. To serve. Who these two men are is often obscured by the stars that studded their shoulder boards, and by the lofty commands they held at the ends of their careers. And this too short treatise is to present them not as Admirals and military luminaries, but rather I think how they would be remembered-as human beings. Leaders who were made, not born. They were men who worked hard, studied their fellow man, made mistakes, learned, and tried again. Most importantly, these two men always told the truth - especially to themselves-because they knew that's the only thing you can count on. As far as I can find out, they never quit, and they never laid down a responsibility, or tried to transfer blame to another pair of shoulders. Doing this was no easier for those two men than they are for the rest of us. They just learned and accepted the reality that there is no way around doing you job. No magic, no special internal muses...just hard work and keeping an eye on those twin saboteurs of doing a job right- fear and irresponsibility. 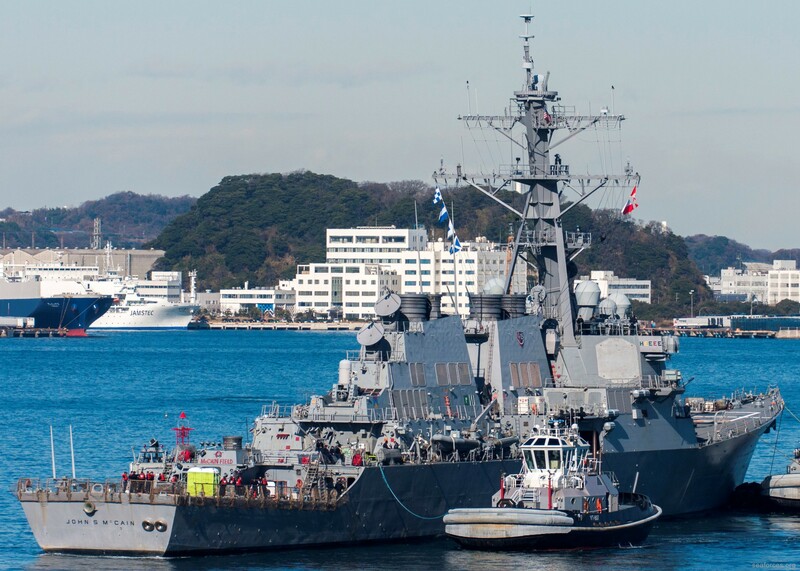 It is an accident that the McCains even went to sea. Because in their Mississippi family, the eldest son always took over the family land, "Teoc", and the second son went into the army. In fact, a McCain served on George Washington's staff. Another served in the Civil War, was badly wounded, and came home to Teoc to die. Yet another was a three-star general in World War I- the Adjutant General of the Army. Still another was one of the last battle cavalry officers and served with "Black Jack" Pershing on his raid into Mexico trying to catch the elusive "Cucaracha", Pancho Villa, and also became a general. Trouble was, John Sidney McCain, Sr. was the third son. The second, Bill, was already at West Point, so "Sidney", as most of his friends called him, went to "Ole Miss", presumably to become a doctor, or lawyer or something useful. Still, he itched to put on the West Point gray. Bill approved and suggested he go up to the big city, Jackson, to take some entrance exams they were offering for the U.S. Naval Academy as practice for the rigorous West Point tests. He did so well on the tests he got an appointment to Annapolis, and decided to go to the sea in ships. It changed McCain history. Since then, at least five McCains and blood kin have gone to Annapolis, and several others have joined the enlisted ranks. Nary an Army man in all that time. 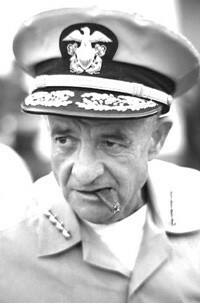 John Sidney McCain, Sr. graduated in 1906 and joined a different Navy. A service of iron dreadnoughts belching black coal smoke, of swinging hammocks, and of underslung bows still evolving away from the ancient tactic of stabbing other ships beneath the waterline. He was ordered out to the old Asiatic Station of song and legend, to serve on many classic ships now long gone to scrap yard and history- the battleship OHIO, the cruiser BALTIMORE, the destroyer CHAUNCEY, and the gunboat PANAY, whose "accidental" sinking by Japanese aircraft two decades later was to be one of the malevolent tidal events that inexorably pulled the United States towards the maelstrom of the Second World War. 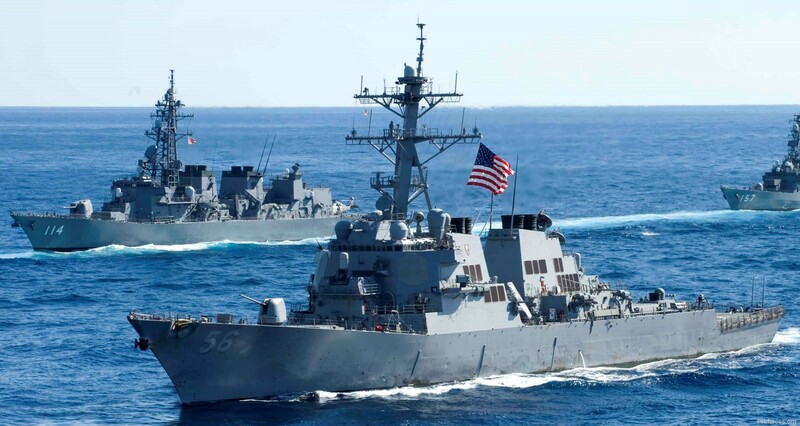 Young McCain served on the battleship CONNECTICUT in Teddy Roosevelt's Great White Fleet, 16 battleships sent around the globe in 1907 to show the world the power of this muscular new nation in the Western Hemisphere. He escorted convoys through the teeth of the German "Unterwasserboots" in The Great War. More battleships, cruisers, destroyers, and gunboats- learning the ways of the sea, and the men who sail on it in ships of iron. Almost unnoticeable in this formidable list of men-of-war assignments is a duty which became instrumental in forming his ideas of leadership. That duty was as Director of Machinist Mates School in Charleston, South Carolina, in 1912-1914. 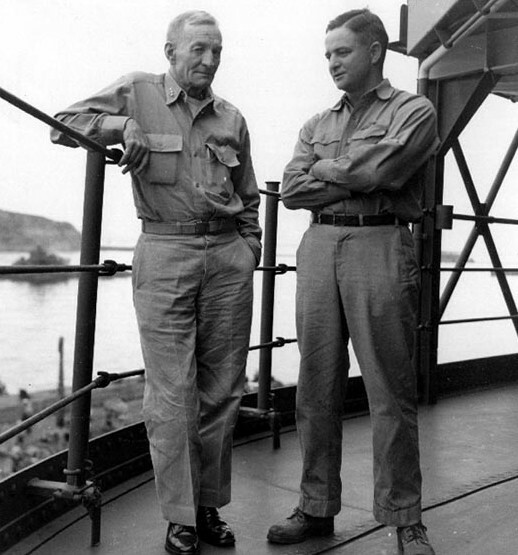 It is likely that it was here, as well as on those hard steel decks, that he understood that the career enlisted man is the heart of any Navy. A fact that must never be forgotten if an officer is to truly "lead". 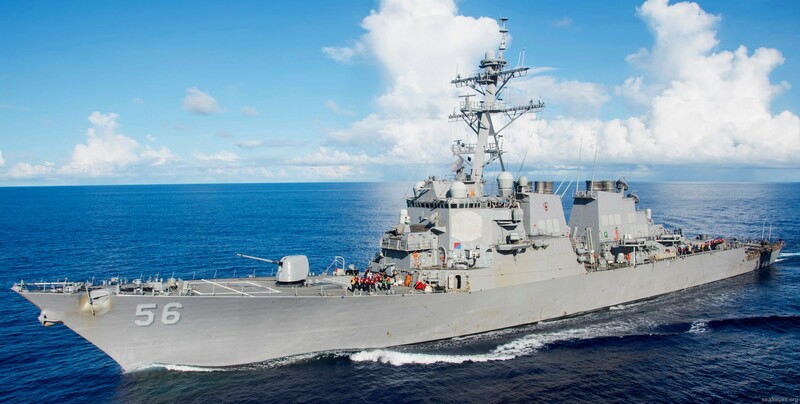 His son, John S. McCain Jr.-second part of this story- was later to put that into a phrase that has become a One Commandment Bible of naval leadership. In the 1930's with the rapid expansion of the naval arm-the marriage of ship and warplane-the Navy had a bit of a dilemma. 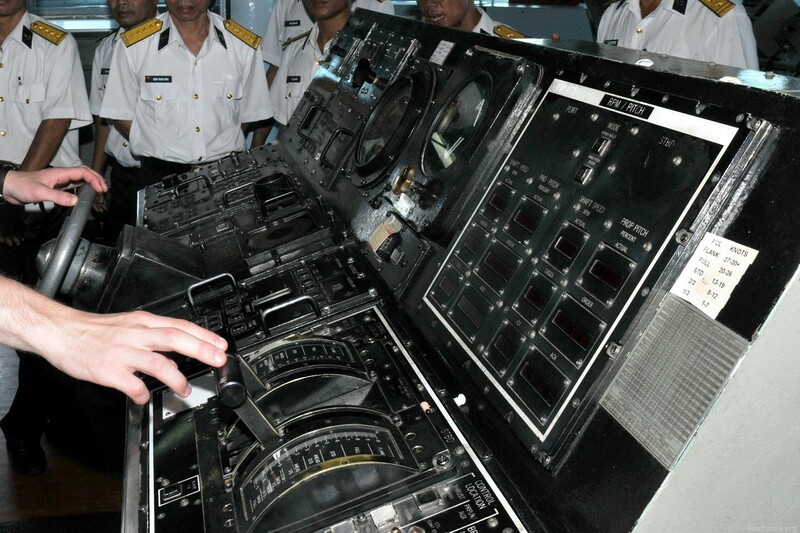 Plenty of naval officers were trained as pilots, but few trained for sea command. The Navy Department decided to look for experienced commanders who might be willing to go to the naval flight school in Pensacola. One of those asked was Sidney McCain, now a Captain- a more serious rank in the small and parochial Navy before World War II. 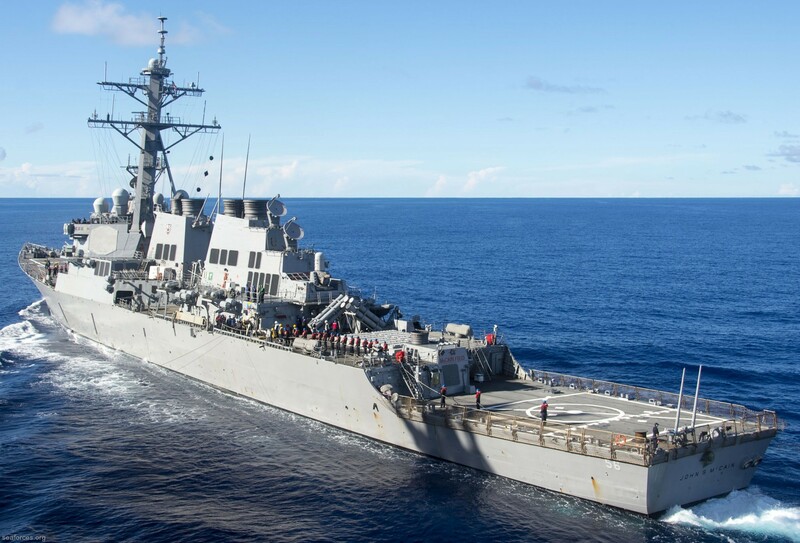 So Captain McCain went down to Florida with a bunch of kids to learn how to strafe and dive bomb, and land on a pitching carrier deck- at the age of 50. Still a record. And in September, 1936, at the age of 52, some admiral or captain pinned the golden wings above his left breast pocket, 52! Now an aviator, he commanded two naval air stations and the carrier RANGER, and in February 1941- the Second World War already mauling Europe- he was made Rear Admiral and put in command of the new combined scouting forces and fleet wings on the West Coast. When the Japanese made their terrible miscalculation in attacking Pearl Harbor, his command was the umbrella against the expected attack on the mainland. May 1942, he took over command of all land-based naval aircraft in the South Pacific. 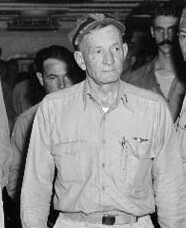 His planes fought the battle of Guadalcanal and helped dent the Japanese effort to "finish off" the Americans in the Pacific. 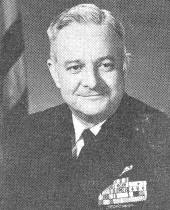 After a stint back in Washington as Chief of Naval Aeronautics, where he got a third star, it was back to the war in later summer, 1944, as Commander of the Second Fast Carrier Force Pacific and Task Group 38.1. Three months later, he took over Task Force 38, Halsey's cavalry. 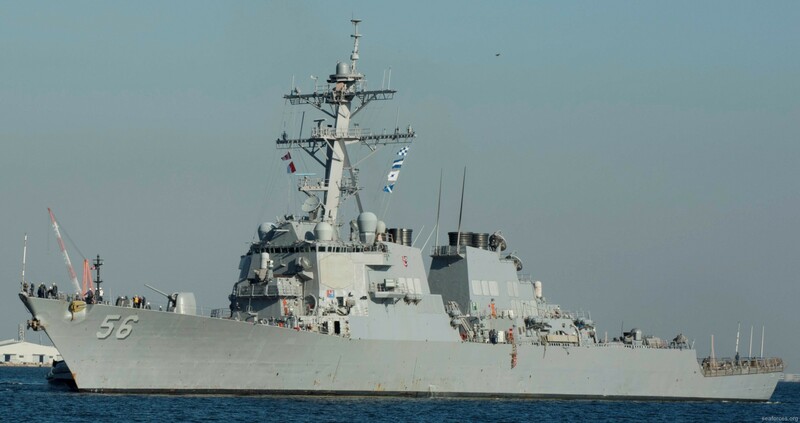 McCain, say the various accounts, became a sort of Jeb Stuart/George Patton of the ocean, dashing from flash point to flash point, attacking, attacking, and attacking. He was awarded the Navy Cross for putting his forces between the battered cruisers HOUSTON and CANBERRA, and a hornet's nest of Japanese fighters trying to finish off the crippled ships. In October, he was ordered to take his worn down men and planes for a rest, when a Japanese armada launched a thrust at the American invasion force in the Philippines. 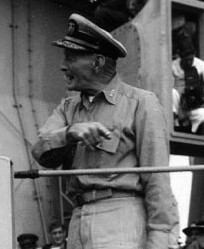 Halsey had been drawn Northward by a feint, and the landing troops were protected by only a light force under Admiral Sprague. McCain raced back to help, but his carriers were too far away for his beloved pilots to make it back to the carriers after the strike. He pressed onward, hoping for another hundred miles, but the reports from the beach told of increasing peril and cries for help. 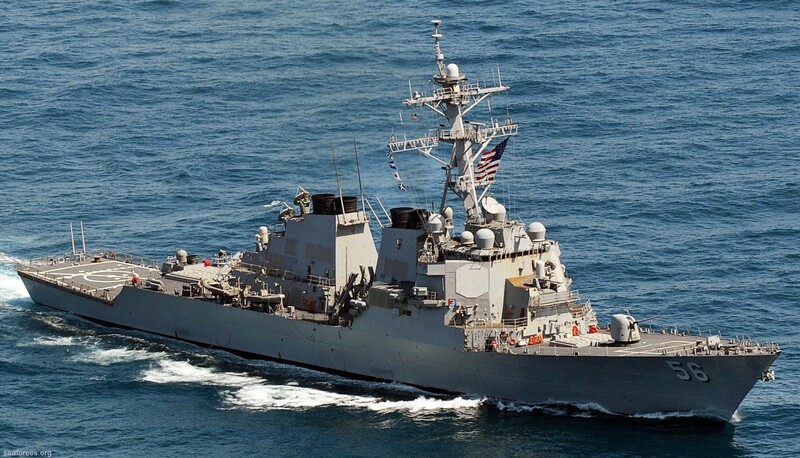 Admiral McCain went down to his cabin to think a few moments. Then came up and said, "Turn into the wind". The order that precedes an aircraft launch. 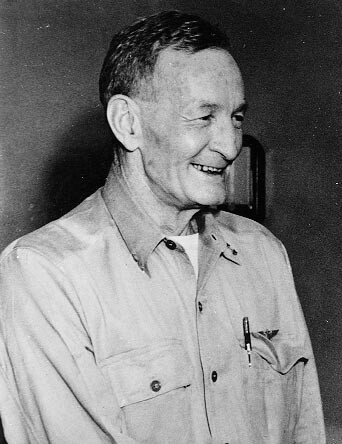 His aircraft and Sprague's heroic actions caught the Japanese force flatfooted, and the invasion was saved. Most of his planes either landed safely ashore or on other carriers. But, it's one of those decisions that take life from a man. Before final notes, it is important to say that Sidney McCain was a colorful man. For reasons undetermined, he wore his officer's hat without the grommet-the plastic frame that keeps the cap a taut disk. Hence photos show him with a shapeless khaki lump on his head. He never smoked factory-made cigarettes. He always carried rolling papers and a bag of Bull Durham in his breast pocket. It is said he could roll a cigarette with one hand. He was also a man of intense loyalty and honor. Once, someone came up to him and said a friend had called McCain an S.O.B. He said simply: "I don't believe it", and left it at that. Photos of him show a calm, nearly gaunt, somewhat stern-looking man, but with very, very warm eyes With a touch of basset sadness, as if they had been on watch too long, seen too many things. By pure chance, when I was a newspaper reporter in San Diego, I once ran into a pilot who had flown under him. After some jovial small talk, I asked about my grandfather, the man. He paused, trying to distill his thoughts. Finally, he said "I think he was the finest man I ever met. We would have done anything for him." 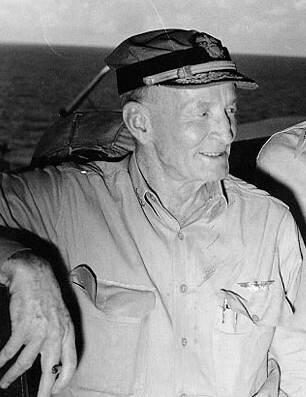 Admiral McCain stood on the deck of the USS MISSOURI as Douglas MacArthur signed the instruments of surrender with Japan. In that famous photo, he is the one in the front row, looking slightly down. I have seen it in a hundred books. Then he got special permission to fly straight home for a rest, and made the day-and-a-half island hopping flight in the back of a Navy pursuit plane. My grandmother met him at the Coronado air station, and at the welcome home party, he sat down and quietly died. He had been home for the war for less than half a day. "It cost him his life later, but his work was done, and victory, which he lived to see, had come to his country." 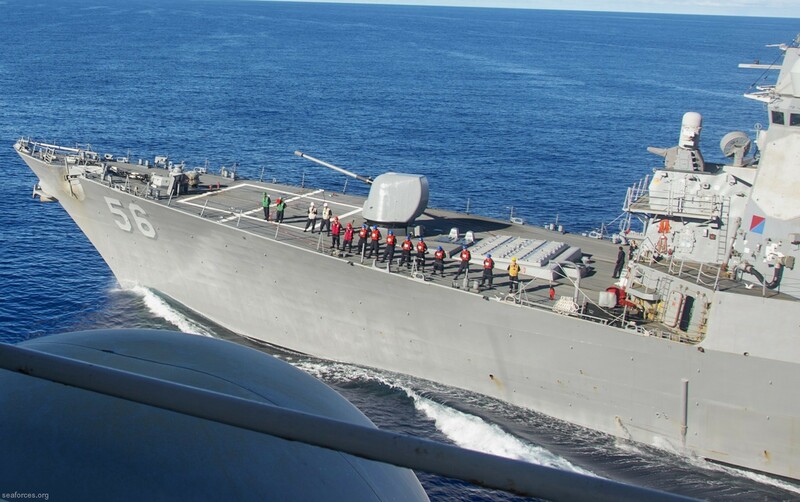 His son, the second Navy McCain, was made of the same stuff. But his story is also clear proof that regardless of how simple it looks in terms of "blood lines" and "pedigree," leaders are made, not born. Known throughout his life as "Jack"- he disliked the nickname "Junior"-he was born far away from the sea he was to spend so many years on. 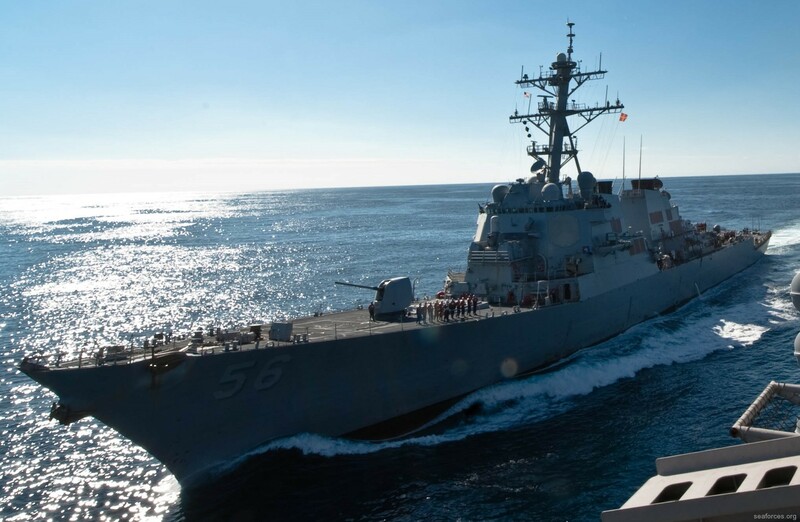 His mother was traveling across country while the senior McCain was at sea, and stopped to visit her sister in Council Bluffs, Iowa. 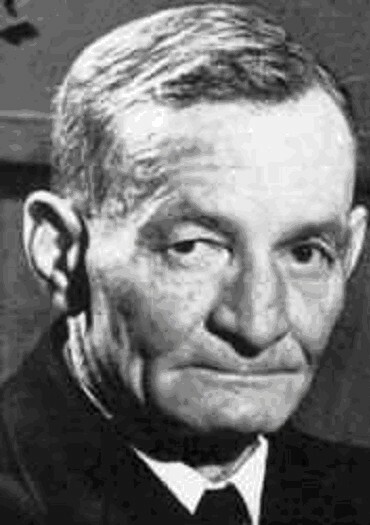 There, in a frigid January, 1911, was born the second half of the first Four Star father-and-son set in naval history. Moving around as military families do, Jack McCain remembered being assigned to shovel coal into the family furnace at 5 a.m. He remembers getting in trouble at school for telling his little friends he saw a bear on the way to class, but being defended by my grandmother who said, "All little boys must have an imagination. Don't worry, he'll know about honesty and the truth." Her prescience was lathe-accurate. For anyone will tell you that John Sidney McCain, Jr., like his father, was the most honest man you will ever meet. His word had the constancy on Newtonian laws of physical motion. 'An officer and a gentleman' is the title to which he pays absolute allegiance. Sooner could Gibraltar be loosed from its base than could "Mac" be loosed from the principles which he has adopted to govern his actions. He went to Annapolis very young-too young, he was later to say. At 16, in 1927, he entered the harsh world of the Plebe. It gave him a dislike of hazing he carried with him the rest of his career. He thought it a poor substitute for leadership. Loaded with demerits and mediocre grades, he staggered through four years and became an ensign in 1931, in a country in deep depression. As proof of the made-not-born postulate, his first steps were anything but omens of stellar things to come. 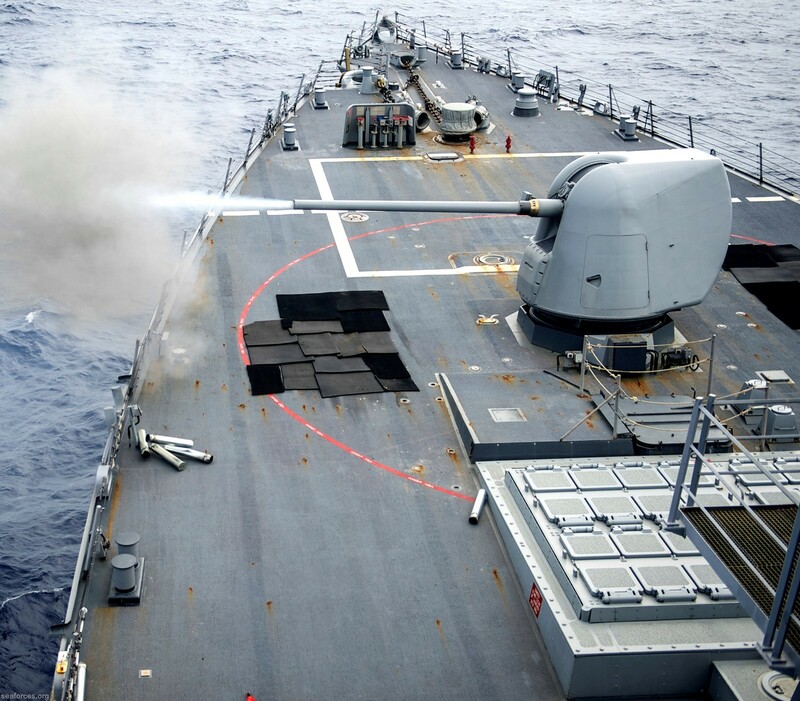 His first official entry in his service records is the Navy Department denying his request to go to the Naval Optical School in Washington after graduation. It seems he and a classmate pal knew there were a lot more pretty girls in Washington than on a battleship and tried a rather pitiful finesse with the application to lens-making school. The sages in the Navy gave the request no serious thought, because less than ten days later he was ordered to the battleship OKLAHOMA. Learning to command rather than to grind glass. 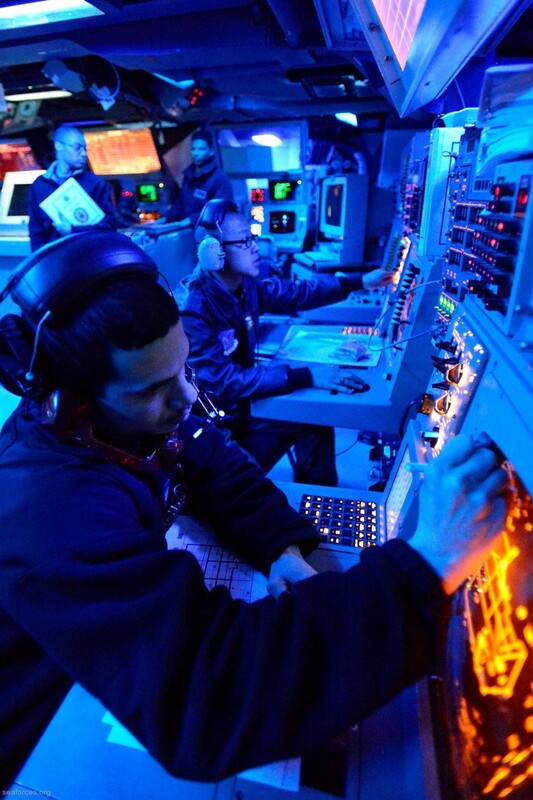 Unable to get into flight school because of a heart murmur, which is now medically understood to be benign, Jack McCain applied to submarine school. The sub school doctors had more generous stethoscopes, apparently, and after two formative years on the massive OKLAHOMA, he went off to New London to learn about the still-evolving theories of warfare under the sea...of sonar pings and "bearing- mark" and "Fire One!"... and how to crash dive without sinking your boat. He served upon a couple of wheezing old World War I subs- the peacetime, depression Navy was cut to the bone- then taught math and physics to bored midshipmen at the Naval Academy. He was later to say the experience was very important to his future role as one of the Navy's foremost speechmakers. "If you can keep a bone-weary plebe awake, it's easy to get you message across to anyone who's had a night's sleep." After the Japanese Zeroes crossed the Pali that terrible Sunday, Jack McCain went to war under the seas, commanding three different submarines, and sank several Japanese ships, including the submarine's most dangerous foe, a destroyer. 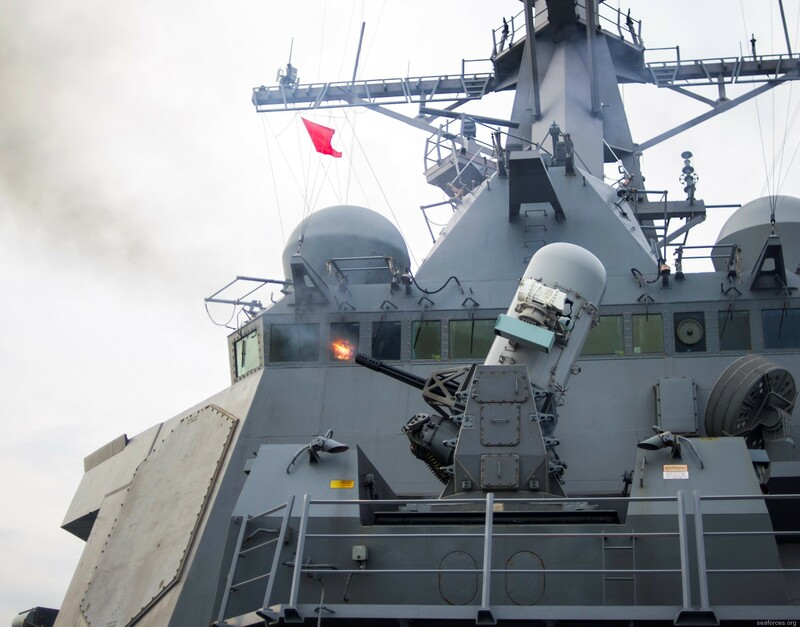 On rare occasions, he spoke of the time, early in the war, of firing four torpedoes at a sleepy Japanese battleship, unaware of the menace below, and hitting her three times without a single explosion. Then having to dive and stand against prolonged depth-charging, while cursing an unknown pre-war torpedo contractor. For these and other exploits, he was awarded the Silver Star and the Bronze Star and a small pile of commendations. After the surrender, he sailed his sub into Tokyo Harbor. 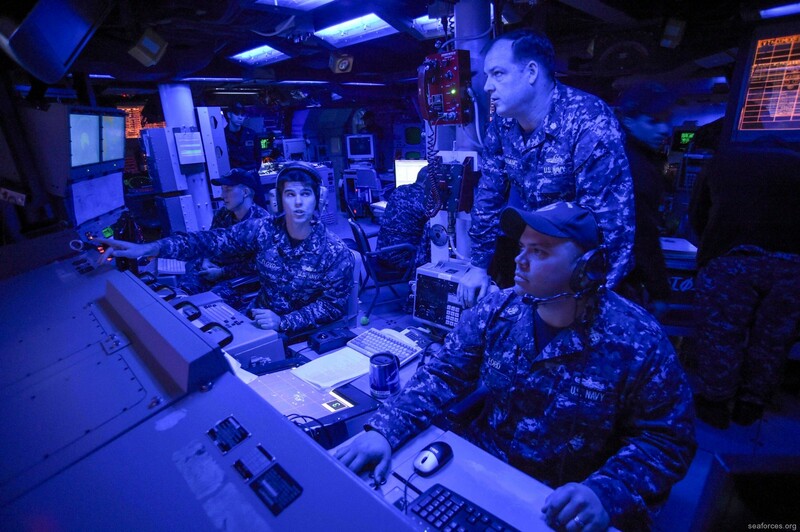 There is a photograph of him and his father, in khakis, on the bridge of a submarine tender. Leaning on the gray railing are the young, wiry, dark-haired sub skipper and the older, also wiry, but terribly weary, carrier admiral. A few hours later, Admiral McCain was to leave for the United States and his quiet death, his son never to see him again. So the nearly chance meeting was a blessing Jack McCain was always grateful for. 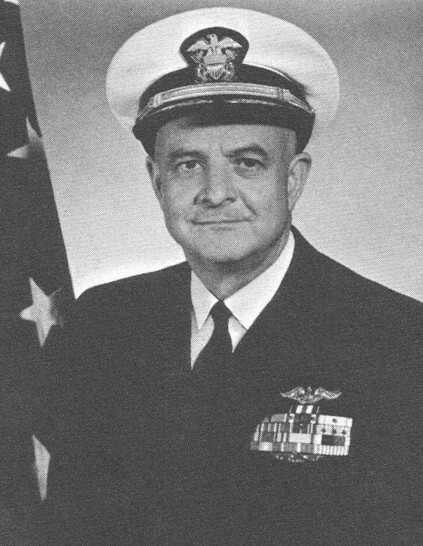 In the post-war, Jack McCain went through a series of duties- submarine division commander, executive officer of a heavy cruiser in Korea, and a variety of other commands. He rose from Commander to Four-Star Admiral. 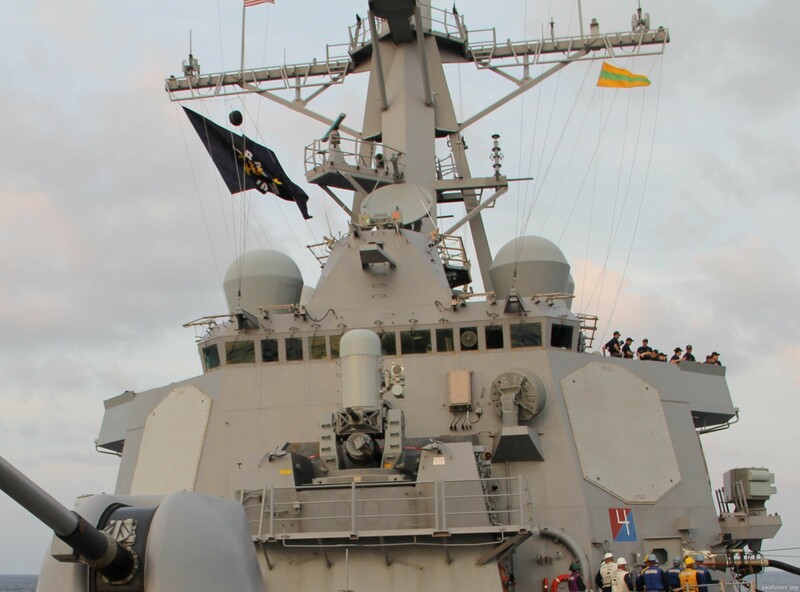 At flag rank, his commands included Commander Amphibious Forces Atlantic, Military Representative to the United Nations, Commander Naval Forces Europe. Finally, from 1968 to 1972, his last post, as Commander of all U.S. military forces in the Pacific at the height of the Vietnam War- CINCPAC. 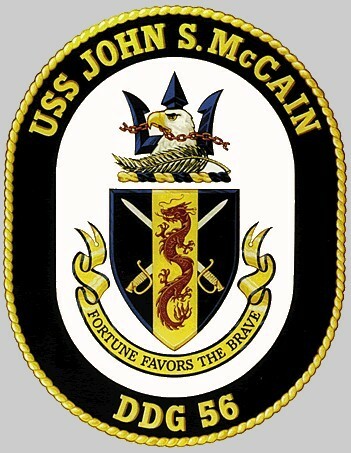 More important than the litany of commands and promotions was Jack McCain the thinker, the speaker, and the naval leader. 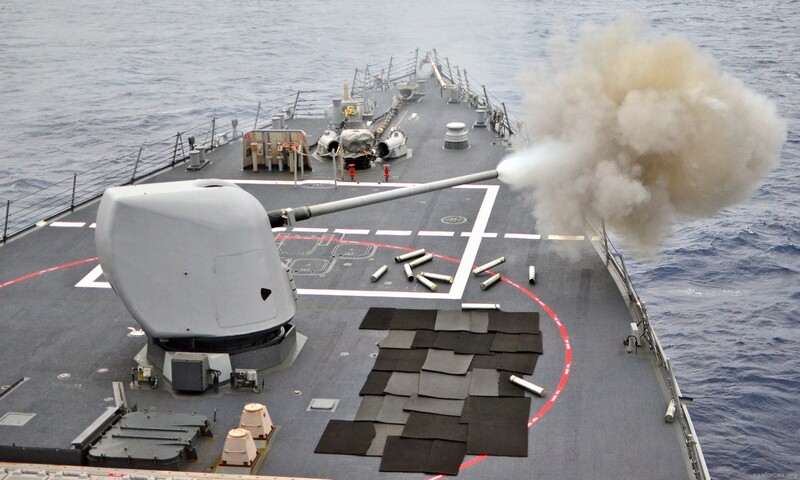 For from the time he had so frivolously asked to be a naval lens-maker, he had slowly matured, thinking about responsibility, about leadership, and about seapower. He began writing and talking about it. He learned the power of the image and the metaphor.